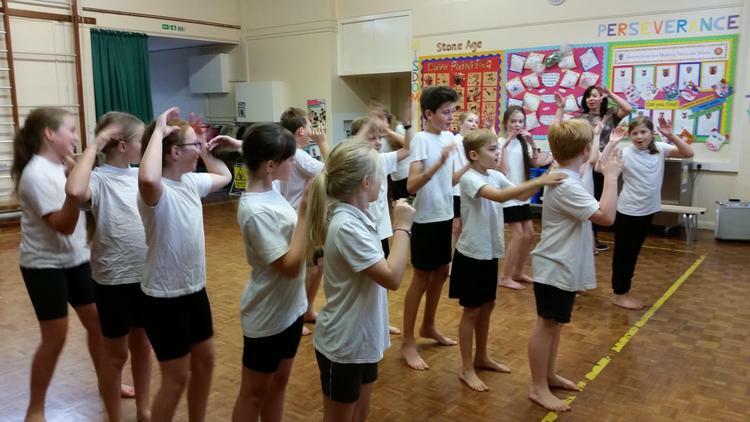 We have continued our rehearsals of 'We Will Rock You' this week and it is gradually coming together. Now that everyone knows their lines, they are really beginning to own their parts. 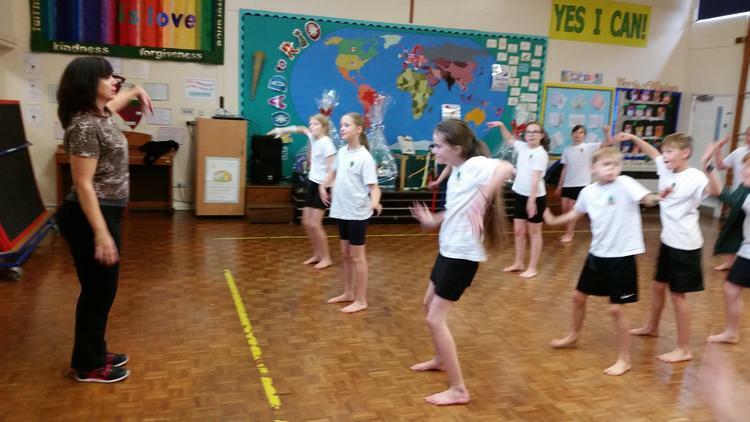 Beech and Silver Birch classes have perfected their danses and the songs are sounding great. If you have not already brought in your costume, please do so by Monday so that we can begin to rehearse in the right clothes. On Friday morning, we welcomed Mrs Cooper into class again for our third transition session. 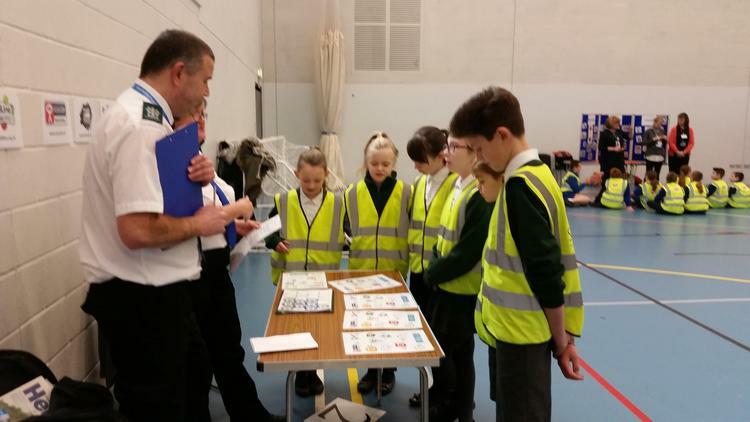 We covered a lot of ground, including school rules, uniform, timetables, rewards and punishments and how to use our school diaries. Some of our 'What if.....?' 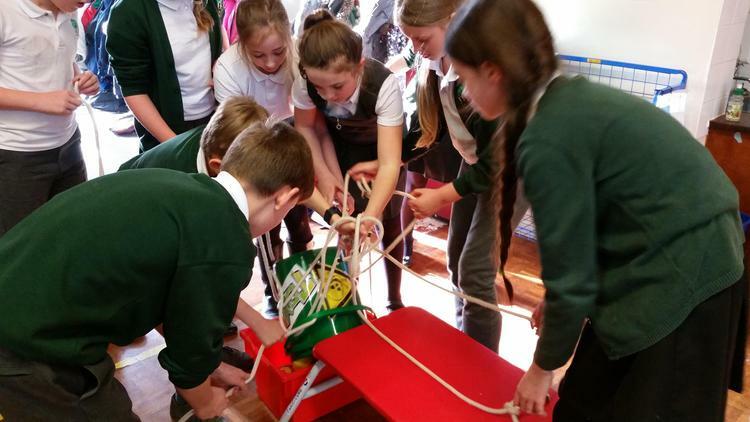 scenarios were a little extreme, but as Mrs Cooper says, all you need to do is be polite, follow the school rules and complete your work, you will reap the rewards and avoid getting into trouble. It's quite simple really! 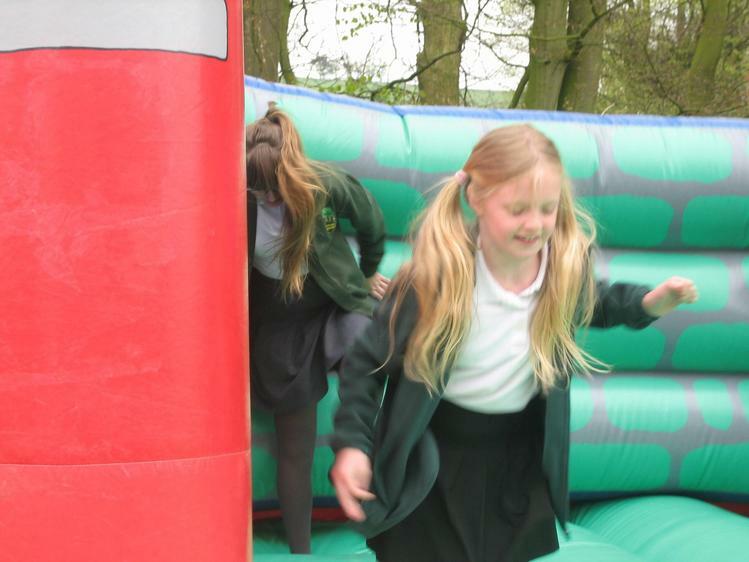 This was another full-on week, with lots of play rehearsals followed by Sports Day. On Thursday morning, parents were invited in to participate in a maths lesson with their children. 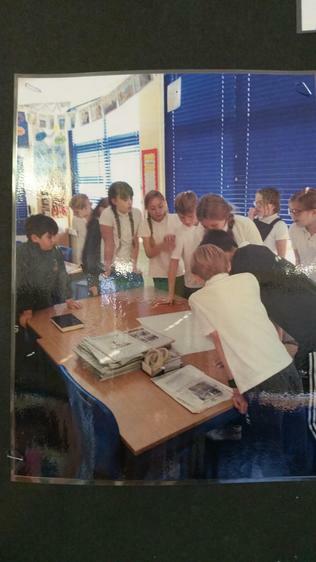 Sadly, no Year 6 parents joined us, but we certainly stretched our minds with logic problems. Below is an example of one we tackled as a whole class. Can you solve it? 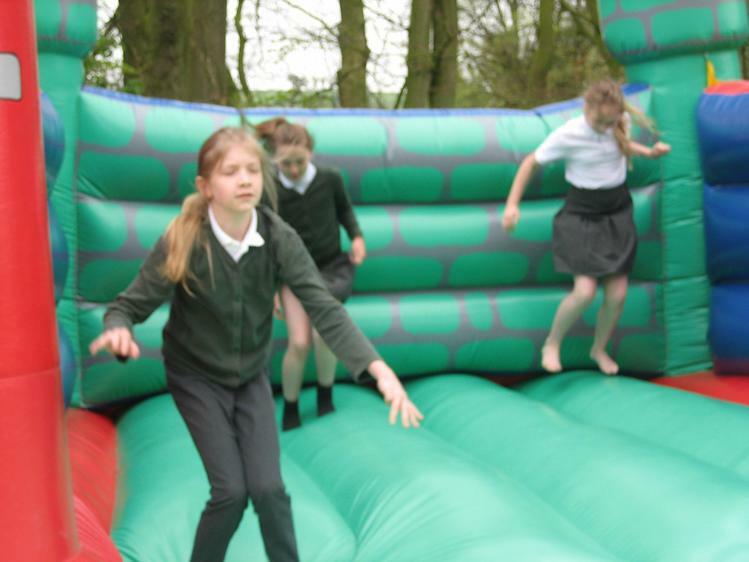 The weather was very kind to us on sports day - pleasantly warm, but not too hot. 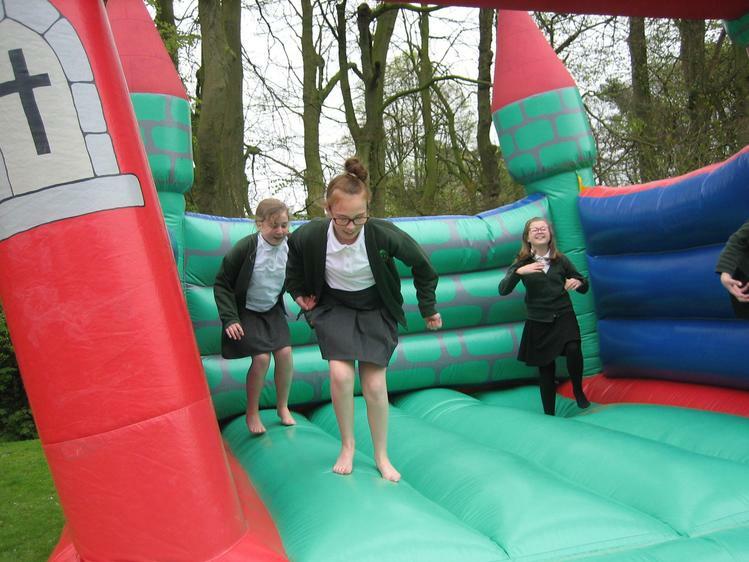 Everyone gave of their very best and it was great to see every child enjoying themselves. As Mr File said, you don't have to be the best, just to try your best. Congratulations to all those Year 6 children who won our various cups and a big 'well done' to everyone else for participating so well. After a fun-filled morning, it was quite a challenge to settle the class down for some RE, but we managed it! 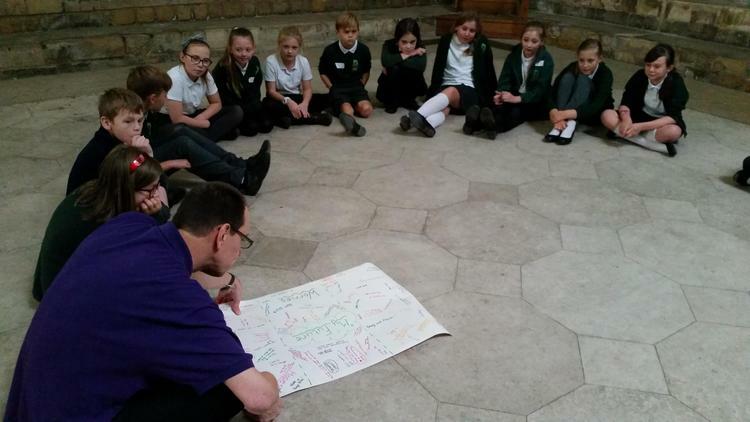 In small groups, they each presented their 'Big Question' to their classmates and some interesting discussions ensured? What would your opinion be if you were asked questions such as 'When, if ever, is killing justified?' or 'Should people have the right to carry weapons?' Our presentations are available below, so please have a look at them before you make your own decisions. Yet another week of our last term has positively zipped by. Mrs Seymour has very kindly been in several times to help us with play rehearsals. She is a great director and we really appreciate her time and expertise. Thursday this week was an art day. You may recall that last year we put on a whole-school art exhibition in July (our theme in Beech Class was the rain forest) and this year we will be doing the same. 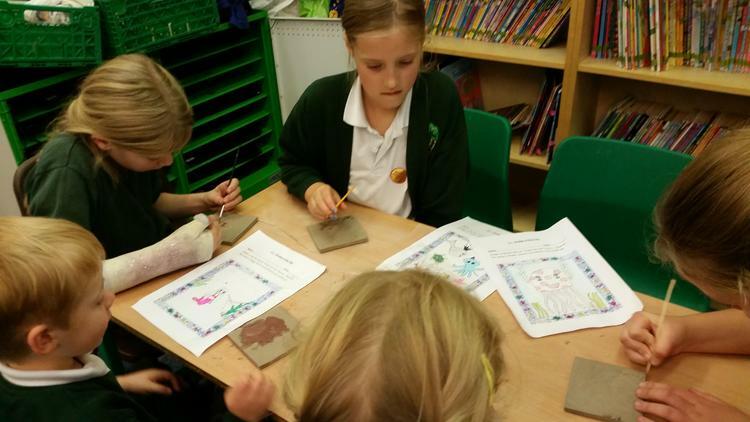 After an introduction and some tips from Mrs Godden, we each created our own artwork in the pointillist style. This style of painting was first created by Georges Seurat, a 19th century French artist, and entails painting using millions of tiny dots. Of course, we did not have time to paint a million dots, so we used cotton buds to create our pictures. The results were great, so please come and see (and perhaps even purchase) our pictures on Friday 7th July. You won't be disappointed. Mrs Cooper visited us for the second time on Friday. 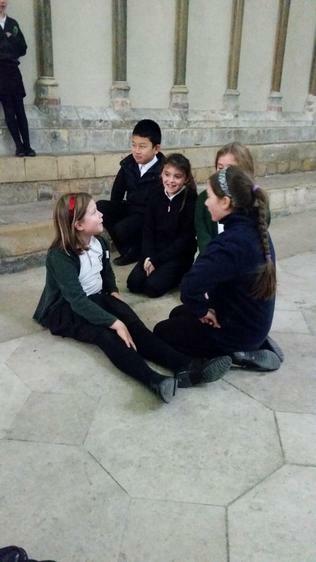 This week's discussions revolved around rumours we have heard about secondary school. These were some of them. Do you think these are true or false? Homework - Spellings and times tables as normal. Please also make sure you know all your lines and song lyrics, especially for the second half of the play. Some of us are still very unsure and this is holding us back at rehearsals. 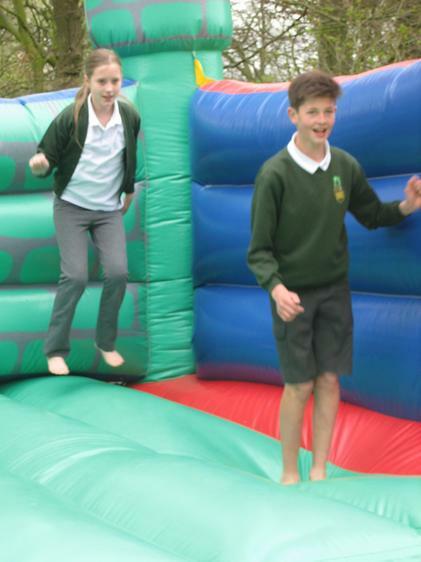 Unbelievably we have reached term six - a bitter-sweet term for many year 6s as they prepare to leave primary school and make the leap to secondary in September. 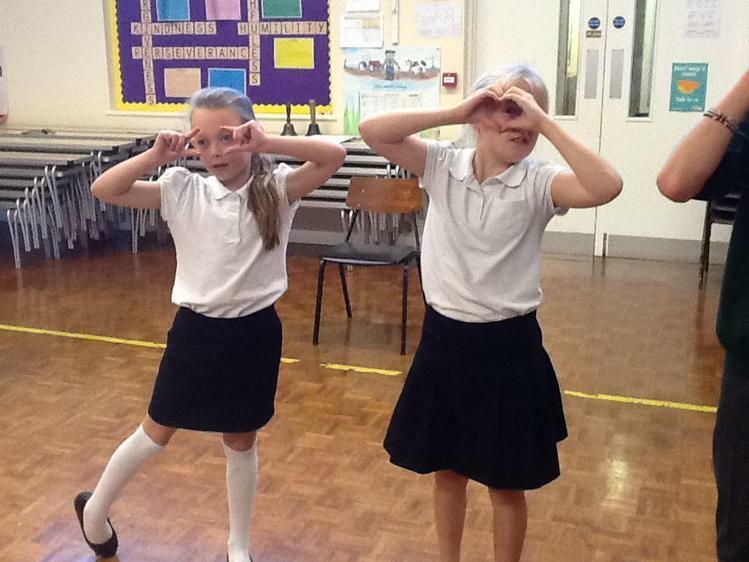 However, there is plenty still to do this term, most importantly the KS2 production. 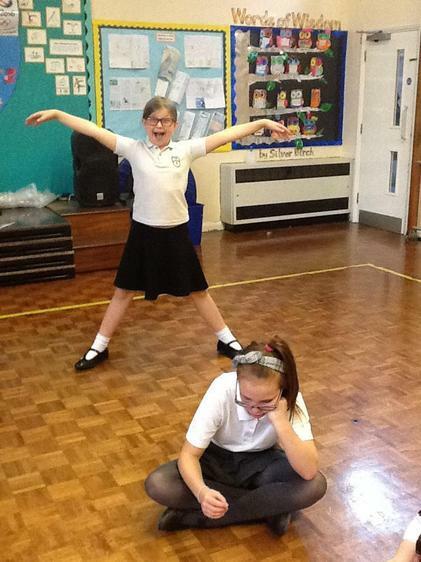 It is very pleasing to see how hard the children have worked over the half-term to learn their lines and now, with some much-appreciated help from Mrs Seymour, they are beginning to grow into their roles and begin to act. There's still lots of hard work to be done, but we are looking forward to a really dynamic show. Thursday saw a special assembly from the NSPCC helping the children to recognise inappropriate behaviour, how to stay safe and how to ask for help when they need it. 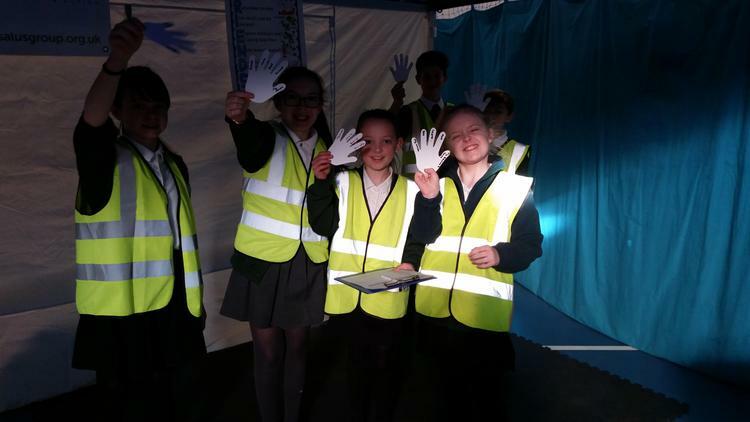 They were all reminded that Childline is available 24 hours a day and shown how to remember the telephone number using their fingers (0800 1111). 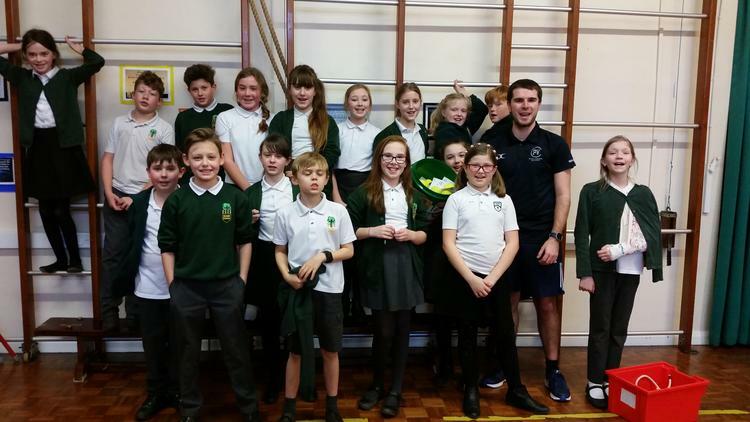 Following the presentation, they were each given a sponsorship form and asked to raise money for the NSPCC (to help even more children stay safe) by taking part in a spellathon. Therefore, this week's spellings are Sets 3 and 4 from the sponsorship form. Please try to support your child with this initiative if you feel able to. 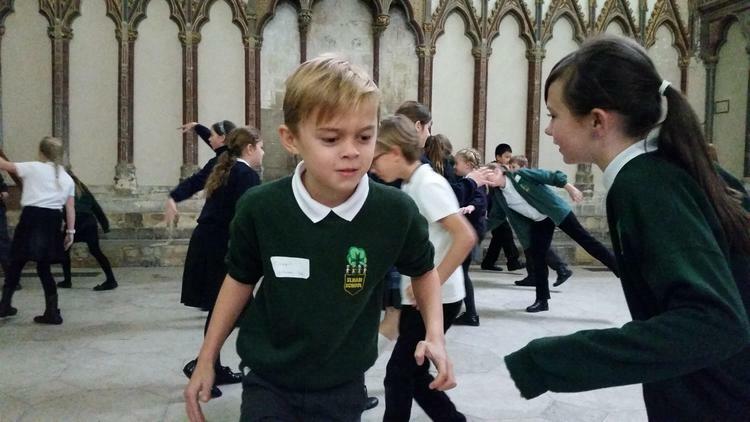 Transition to secondary school can be a worrying time for the children, and as such, we organise several specialised sessions this term with Mrs Sarah Cooper which help to prepare our pupils for the move. 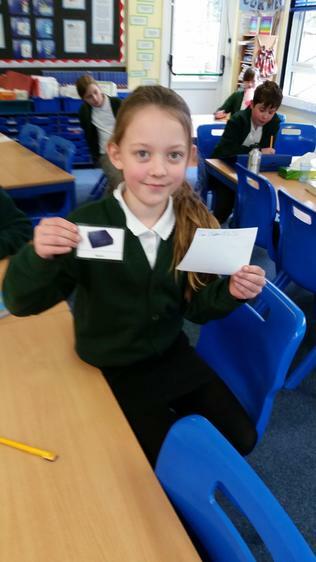 The first of these took place on Friday and each child had the opportunity to talk about what they were looking forward to and what might be concerning them. 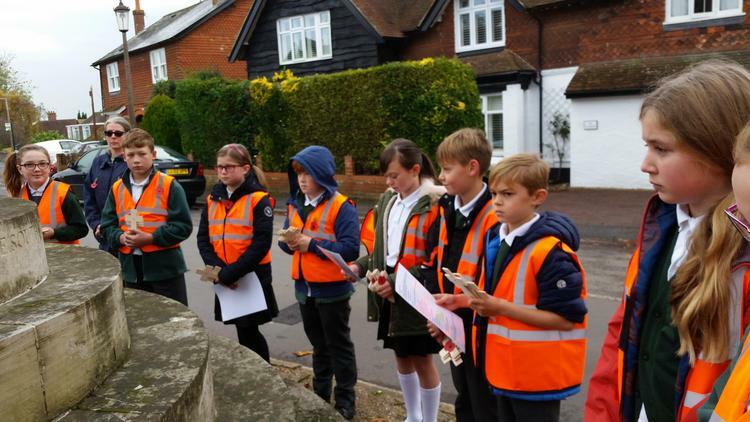 Over the next few weeks, Mrs Cooper will be covering a wide range of secondary-related topics including transport to and from school, organising your school diary and yourself, uniform, homework, finding you way around at school and friendships. 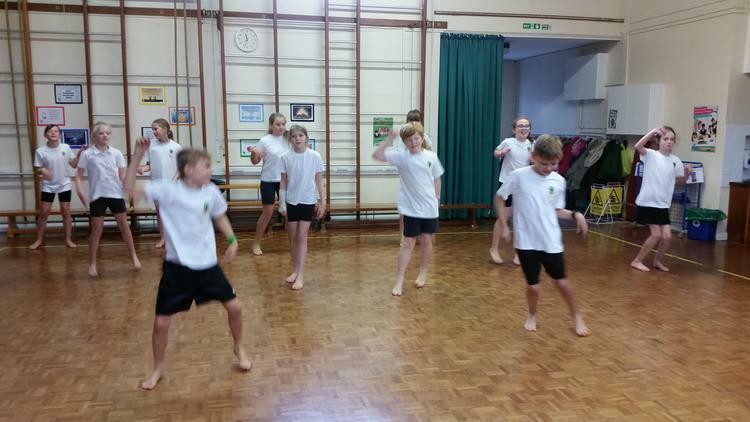 Finally, on Friday afternoon we had some fun (and exercise) when we learnt some bhangra dancing in RE. 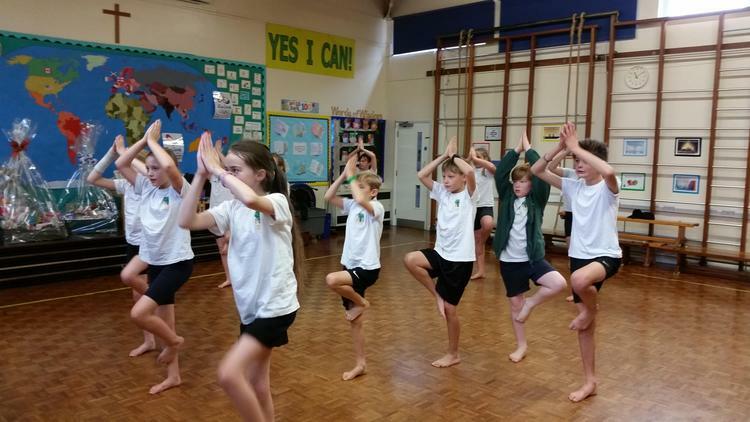 We were learning about the Sikh festival of Baisakhi (harvest festival) and bhangra dancing forms part of the celebrations for many Sikhs. Below is one of the videos we danced along to and some photos of us in action! Well, we survived the dreaded SATs week! Well done to everyone for working so hard since September. Big thanks must go to Mr File for organising breakfast for us every day during the tests. 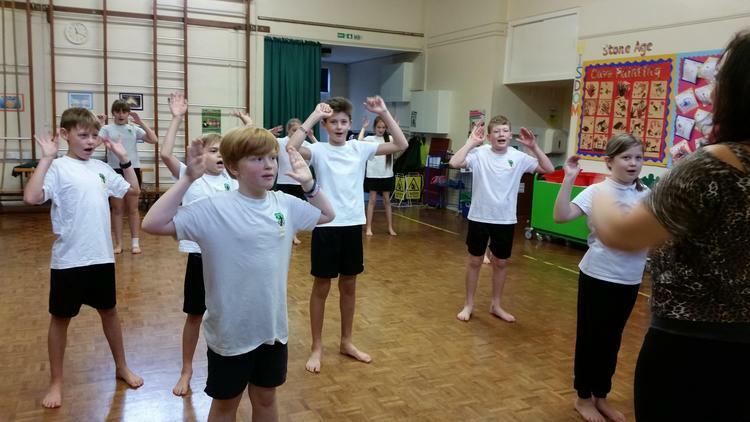 He managed a different 'special' each morning, culminating in a 'Full English' on Thursday. It was absolutely yummy and it was unbelievable how much some of us where able to consume! Grateful thanks also go to Chloe's dad, Mr Hobbs, for supplying the delicious bacon and sausage.We thought the tests were OK, so are feeling quite confident about how well we have done. We won't get our results until July, but in the meantime we have our summer production to rehearse. Mrs Short and Mrs Godden are keeping us on tenterhooks about what it will be. Despite constant pressure to let us know what it is, neither of them has cracked! Following our final maths paper on Thursday, we spent the remainder of the morning in Eurovision mode. After watching a selection of the song videos in different languages, we learnt how to express our opinions in French. They ranged from 'C'est fantastique! ', through 'C'est bizarre. ', to 'C'est nul.' At the end of the lesson we awarded points to each song, just as they do in the real competition. The winner was Romania's entry - Yodel It! - closely followed up by the UK entry by Lucie Jones. Links to all the songs we watched can be found below. Which is your favourite? 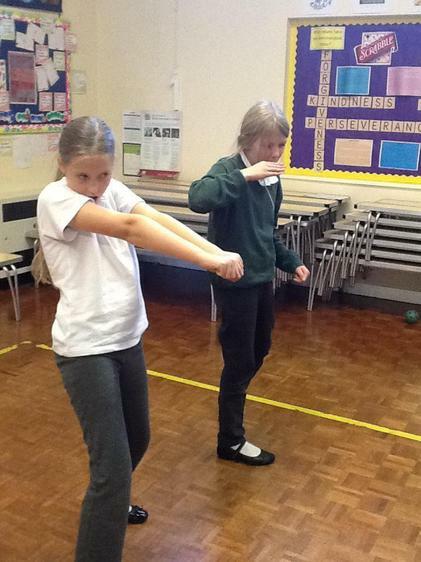 To end the week, on Friday we started a new maths-based project called 'Theme Park Maths'. 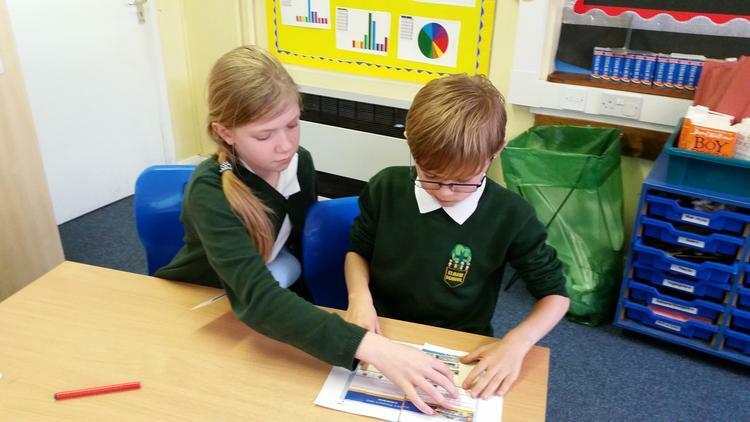 We are working in pairs to design and run our own theme parks. 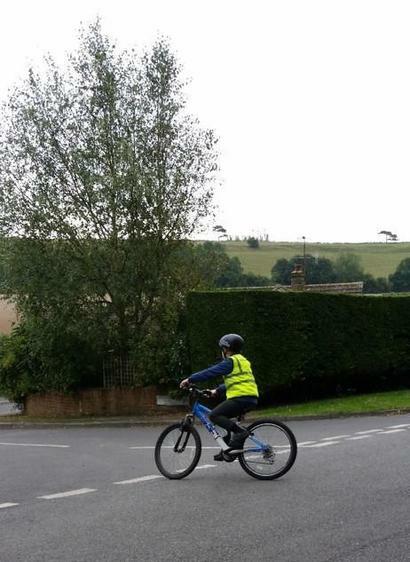 We have a budget of £500,000 with costs given for different rides and services. For instance, a roller-coaster would set you back £50,000, whilst a toilet block is a mere £1,000! Over the course of the next few weeks, we will be calculating running costs, revenue and profit (using Excel spreadsheets); designing advertising posters, leaflets and tickets; and, if time allows, perhaps even recording radio adverts for our parks. Homework - only spellings this week. 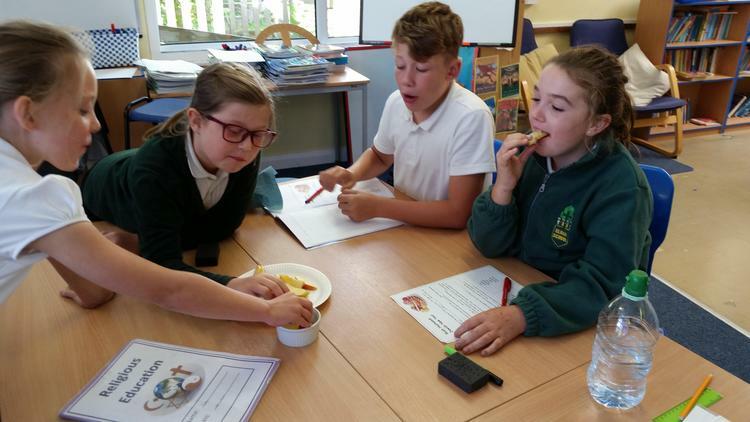 We had very good results this week, so please keep up the good work (even if it costs Mrs Godden a fortune in reward sweets!). 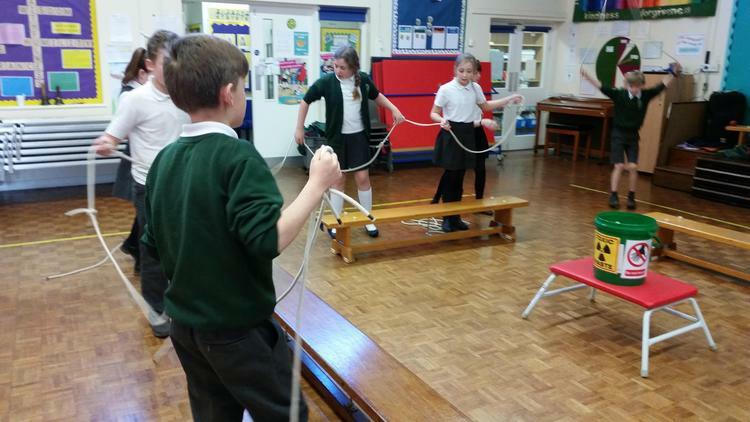 We enjoyed our PE with Mrs Horton this week, despite the weather turning wintery again. We are looking forward to the warmth returning, but in the meantime we are very happy to be playing on the pitch at break times. 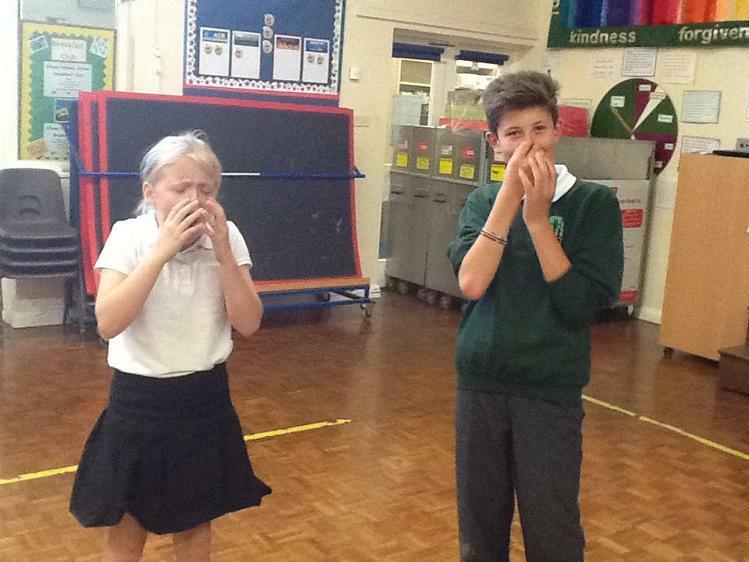 Unfortunately Mrs Hickman was poorly this week, so we missed our music lesson. With only one week to go, we have been revising for our tests. We went over everything we have learnt about grammar and punctuation as well as looking at Mrs Godden's Top Tips for the GPS test. Some of them were as simple as 'If you are asked to write a question, remember to add a question mark on the end.' It's amazing how often some of us forget to do this! We extended our shape coding in Scratch by adding colour and experimenting with changing the width of the pen, angle of turn, etc. 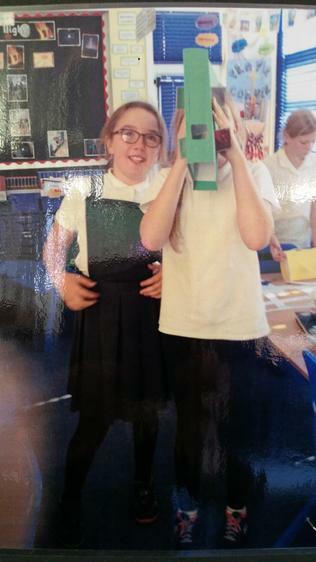 We were really pleased with our results and very keen to show each other what we had created. It is great being able to teach other new ideas. 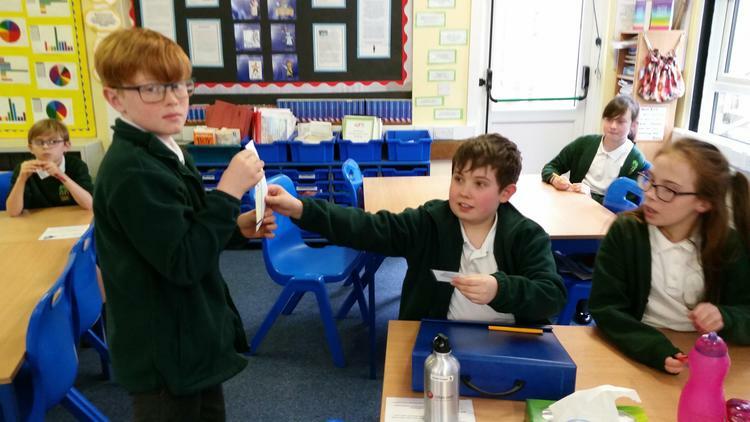 We looked at Pentecost in RE and learnt how, following the death of Jesus, the apostles were given the gift of speaking different languages so that they could travel to other countries and spread the word of Christ. We then looked at the Fruits (Gifts) of the Spirit which Christians believe are bestowed on them by God. This led to much discussion about using these gifts for good or evil, the idea of freewill and how people from other religions use the same gifts. We were so interested in exploring our ideas, we went completely off-topic for a good twenty minutes. Homework - apart from learning this week's spellings, there is no other homework this week. Make sure you have an early night on Sunday and come in early on Monday to enjoy Mr File's delicious breakfast. We have been busy revising and practising for our SATs tests this week. We are all now very good at our arithmetic questions and getting increasingly confident at solving maths reasoning problems. 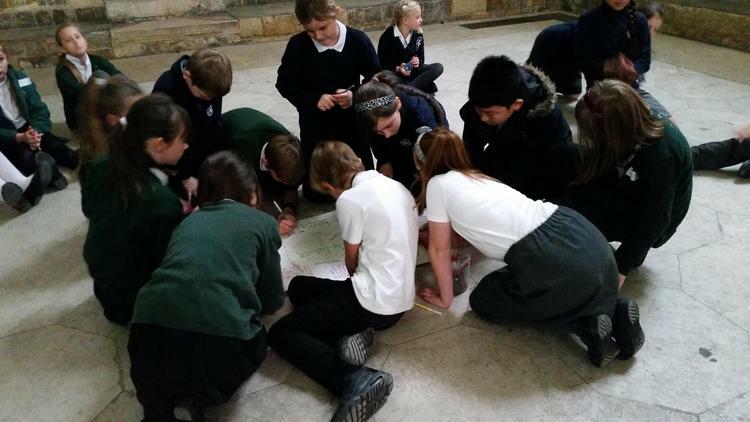 We looked again at word classes and created spider diagrams of everything we have learnt - once it was all down on paper, we were very surprised at how much we really know. Could you identify all the determiners in this sentence? In RE, we investigated what we know about Jesus and how other people, such as his friends and enemies, viewed him. We all drew what we thought he looked like and the pictures varied widely, because, of course, no picture of him was made whilst he was alive. We started a new unit in computing and are learning how to write programs to draw different shapes. We had great fun experimenting with different code to see what worked and what didn't. We used generalisation to take a piece of code and change it to create a different outcome and repeat loops to make our code shorter and more efficient. Click on the link below to see an example of the program we have created so far. Homework - this week's homework is to learn your spellings as normal and to use complete some grammar and punctuation games on Purple Mash. A copy of your login was stuck to your homework sheet. Amazing Patterns Program in Scratch Click on this link to see an example of the coding we created this week. Well, what a week it has been. 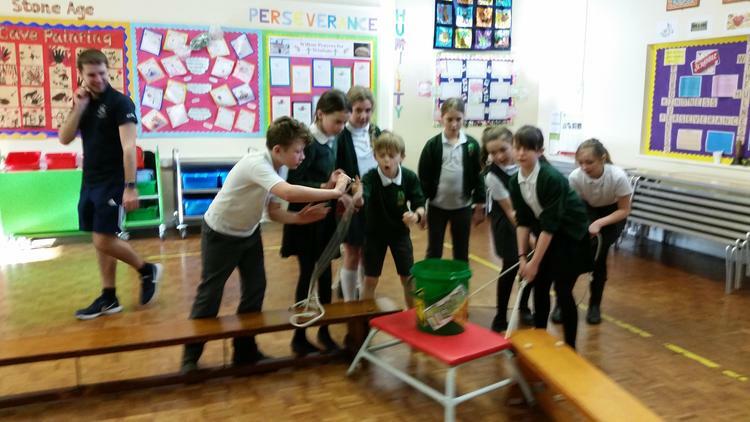 We all came back from our relaxing Easter break, ready to work hard for the next few weeks in the run-up to Year 6 SATs, but little did we expect the call from Ofsted on our first day back! Wednesday was a nerve-wracking day for us all, but we hope we made a good impression on the inspector. She spent a good amount of time in our class watching Mrs Short teach us how to write emotive pieces about a very thought-provoking video call 'The Piano'. There is a link to it below if you are interested in watching it. 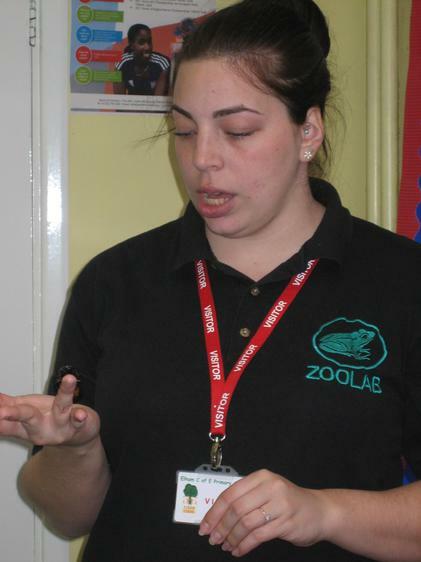 The same day as the Ofsted visit, we were lucky enough to have Zoolab visiting us too. 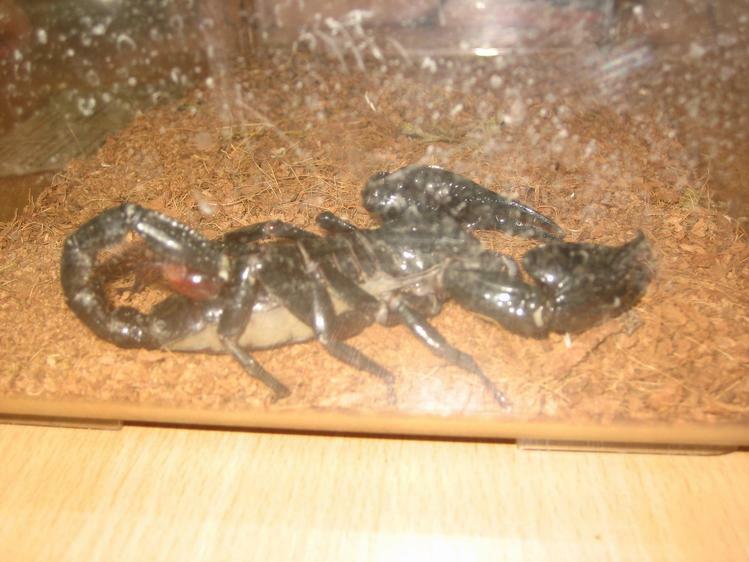 We were shown a variety of creatures including a scorpion, African land snail, a giant cockroach and an American corn snake. 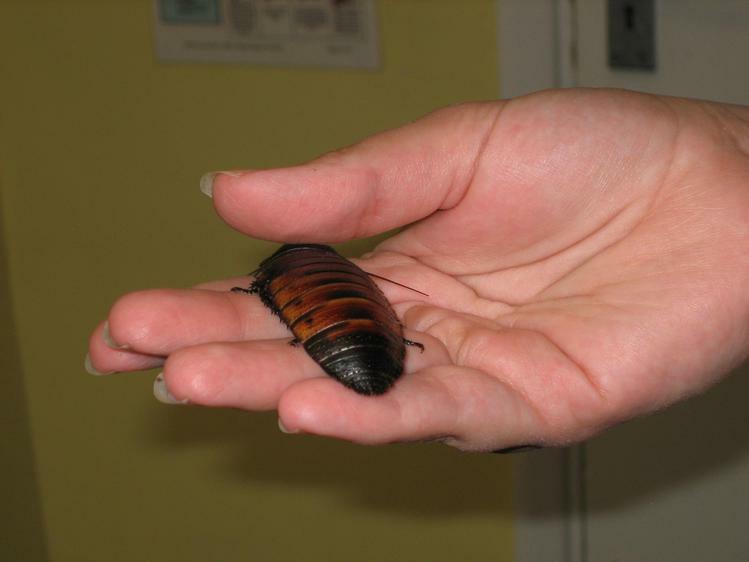 Some of us were braver than others when it came to handling and touching them. In our GPS lesson this week, we looked at common mistakes such as double negatives (I didn't see nothing.) and non subject-verb agreement (You was telling me a story.). Can you tell which is correct? 'I should of told him.' or 'I should have told him.' Ask one of us if you are not sure. 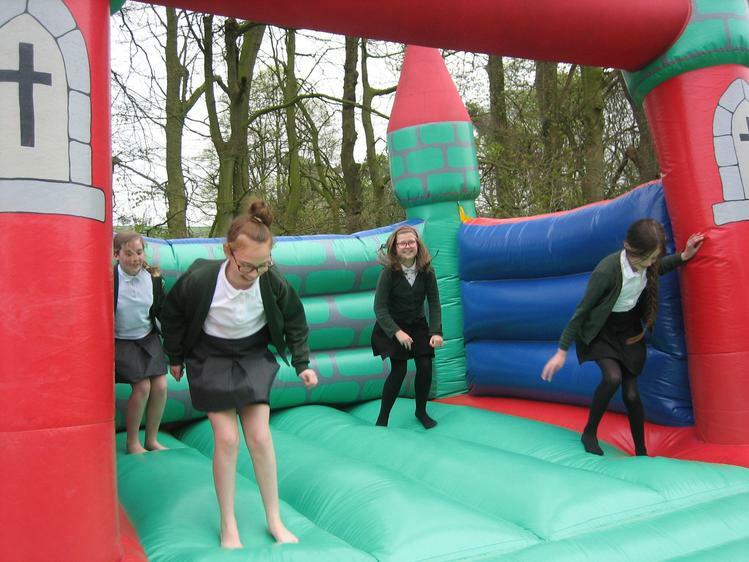 Finally, on Friday, many of us took part in the sponsored bounce organised by the PTA. 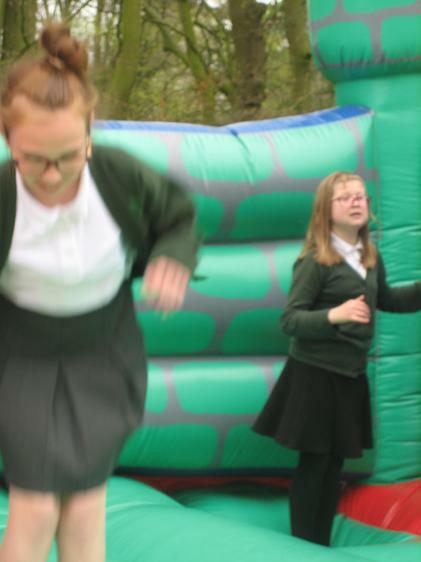 There was much competition to jump as many times as possible in one minute, but we have to wait until the sponsorship money comes in to find out who the overall KS2 winner in. Here's hoping for a quiet week next week! HOMEWORK - please keep up the revision using BBC Bitesize and Mathletics. Details are given in the sheet sent out before the Easter break and there is a copy below. You can also use your login to Khan Academy to revise your grammar along with many other subject. Mrs Short introduced us to one of her favourite poems today: The Lady of Shalott by Alfred Lord Tennyson. It is a very beautiful, but sad poem about a lady who is imprisoned in a tower and who can only view the world through the reflection in a mirror. Once we had read and understood it, she asked us to retell the story from the point of view of one of the characters. There is a link below to a video of the poem being read, along with the words. 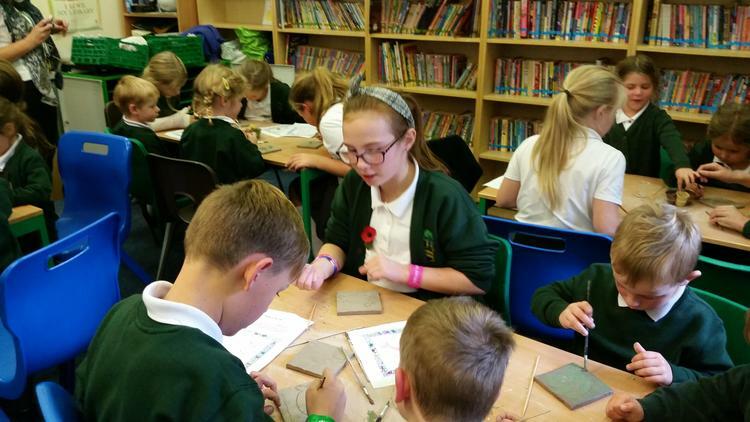 Friday of this week was a very special day as it was Art Day across the whole school. We investigated colour and how to mix it to paint a colour wheel, then we learnt about the life and work of Wassily Kadinsky. He is believed by many to be the first truly abstract artist. He loved to listen to music as he painted and he believed that colours have soul. He particularly liked to paint shapes and lines in vibrant colours. We then had the chance to create our own Kadinsky-inspired artwork. There was a huge variety across the class and everyone enjoyed themselves, as with abstract paintings, you paint what you feel and cannot really go wrong. Have a look at some of Kadinsky's works below. Mr File is planning a Kandinsky gallery in the school entrance corridor, so look out for this coming soon. Mrs Godden will also be posting pictures of our artworks on here next week. 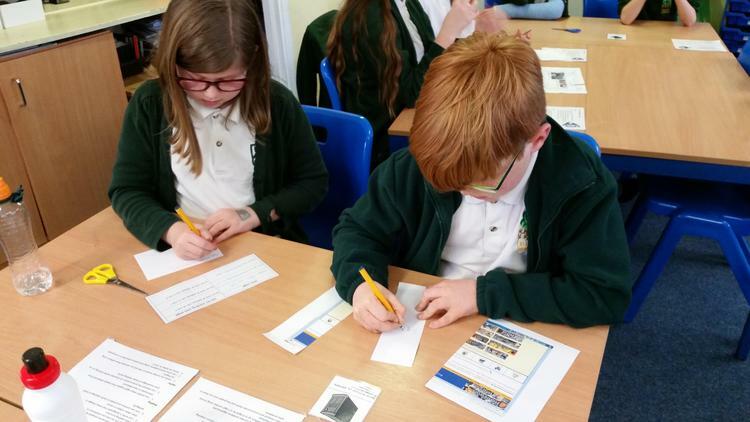 This week we had a chance to put our maths problem solving skills to the test when we were challenged to complete some problems which we being solved across all the local schools in our area. Our books were then compared to those of other children to see how well we are doing and we are doing great! Our investigations into the lives of Sikhs continued with the Guru Granth Sahib - the Sikh holy book. Did you know that it is treated as a person and put to bed each night in its own bedroom, complete with special silk covers? We also covered a tricky grammar point in our GPS lesson - whether to use 'I' or 'me'. Which sentence do you think is correct? Tom and me went to the cinema last night. Tom and I went to the cinema last night. It is the second one - if you cannot work out why, just ask any of Oak class! We finished the best copies of our French poems on Thursday and Mrs Short kindly put them on display in the hall for us. Please do have a look next time you pass through or come to Celebration Assembly. 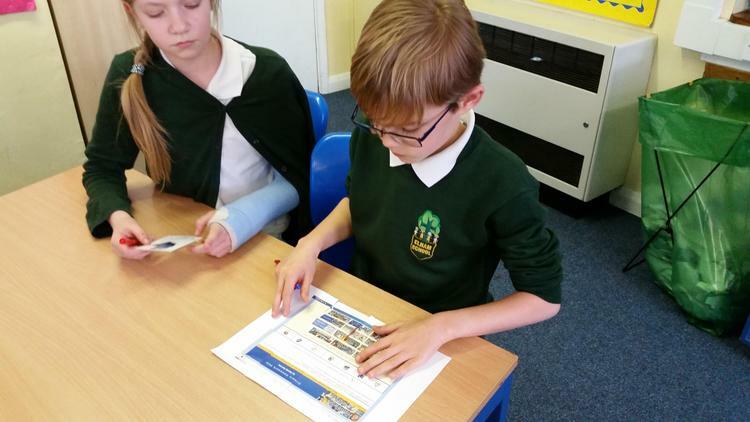 Computing was really fun on Friday afternoon as we played 'Search Bingo' Mrs Godden gave us 16 questions to answer by searching the internet in the quickest, most effective way. It became very competitive as we rushed backwards and forwards, taking each question and trying to finish before everyone else. It was another week full of fun learning. Half-term week flew past in the blink of an eye and we were soon all back refreshed and ready to do our best at all times. We began the week with a comprehension about the plague, which really piqued our interest and this was followed up by Mrs Short showing us a very powerful short film entitled 'The Plague Doctor'. After discussing the content of the film, the type of vocabulary we could use and interesting ways in which to start our sentences, we all wrote our own very descriptive versions of the story. There is a link to the film below if you are interested in watching it. Following our last Computing lesson about our school network, this week we investigated the largest network in the world - the internet. In order to better understand how it works, we took the parts of a PC, servers and routers and acted out how a web page is delivered to a PC. Luckily is happens much faster in real time than in our reconstruction! See below for some photos of us in action. Friday afternoon was RE afternoon. In pairs we used the internet to investigate the lives of the ten Sikh gurus. 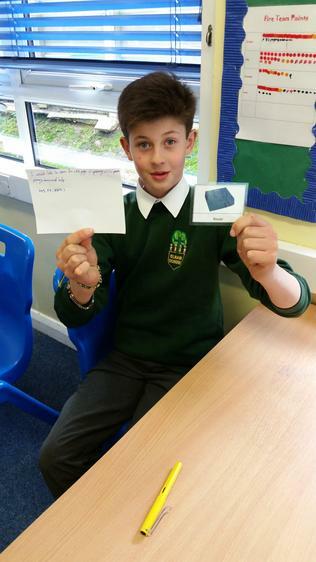 We then created PowerPoint presentations about them and presented these to each other. This was an excellent way of combining RE with ICT. Another busy week has just flown past. We enjoyed being challenged in maths this week when Mrs Short introduced us to algebra. If 3X + 5 = 26, what does X equal? We were also challenged to let our imaginations run riot when we perfected our short stories for the BBC Radio 2 '500 Words' competition. Mrs Short is going to enter all of our stories for us, so wish us luck! French was fun this week as we looked at a poem - La Plage (The Beach). We were able to recognise that each line contained a simile and we used our knowledge of word classes and vocabulary to translate it into English. Mrs Godden was very impressed with our language skills. Next term we will be writing our own poems in French - look out for some of them on our class page. Do you know what a LAN is? Well we do - it's a Local Area Network - and on Thursday we learnt how our school network is made up of many connected devices such as PCs, laptops, iPads, printers, wireless routers, switches and the all-important server. 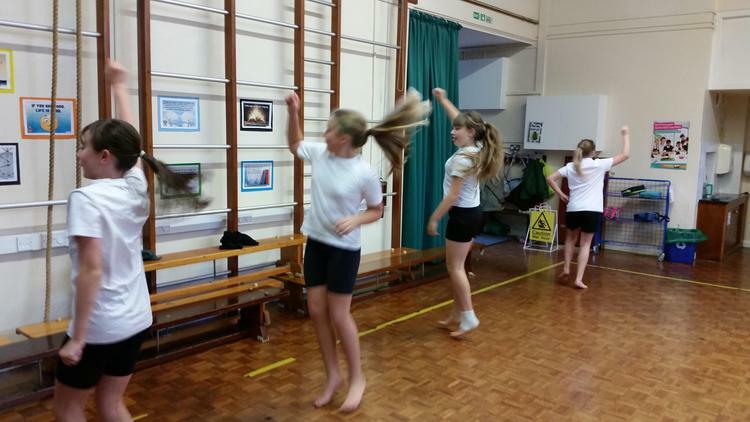 Each term we reflect on our learning by completing our Learning Journeys, which we did on the last day of term. Friday was also a special day as we all came to school in our pyjamas and bought mountains of yummy cakes to raise money for Breast Cancer Care. It was a wonderful end to another busy term. Oak Class in their pyjamas! Homework - 10th February. Complete as much as you can please. Due back by Monday 20th February please. This week has seen us finishing our 500 Words stories, learning about the life of Guru Nanak (the founder of Sikhism) and tackling BODMAS in maths. 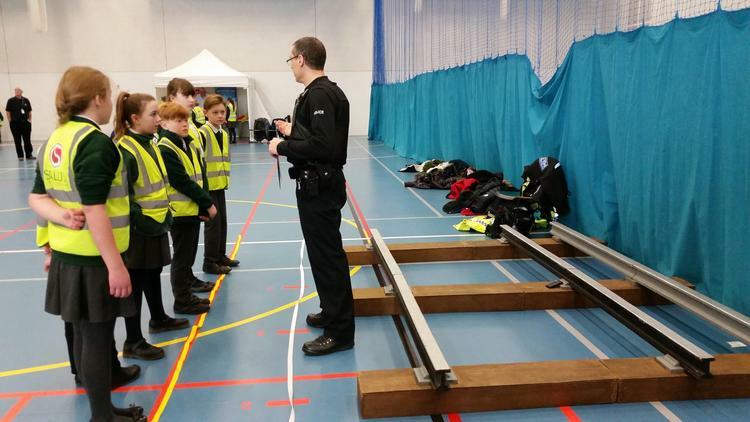 We had a very enjoyable and informative morning on Thursday when we attended the Shepway 'Safety In Action' workshop at the Three Hills sports centre. 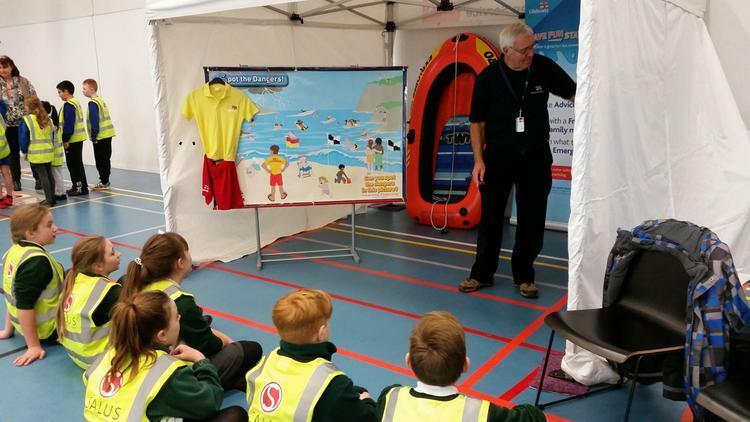 In groups of six we visited 12 stations hosted by organisations such at the British Transport Police, RNLI and the police. 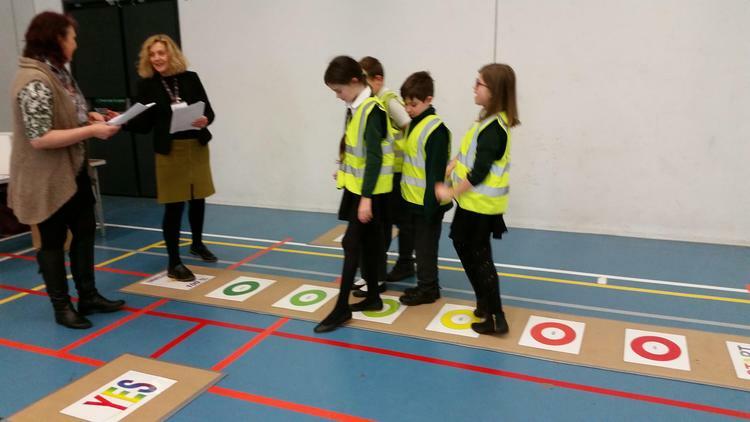 At each station we took part in an activity to help us learn to stay safe, both physically and mentally. 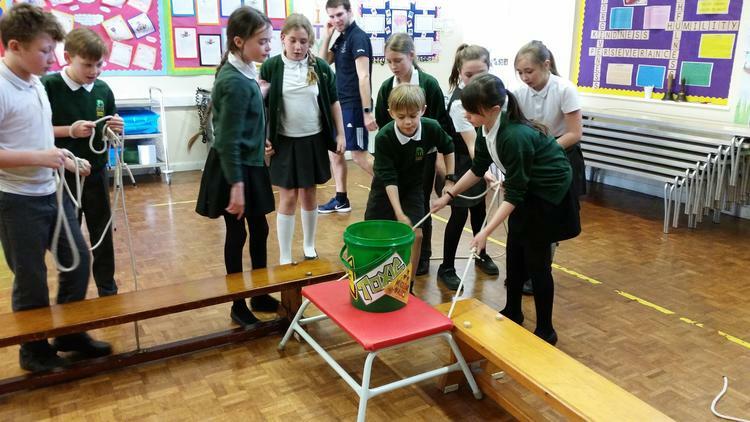 On Friday we had our last session with Mr Jones who has been teaching us teamwork skills this term. 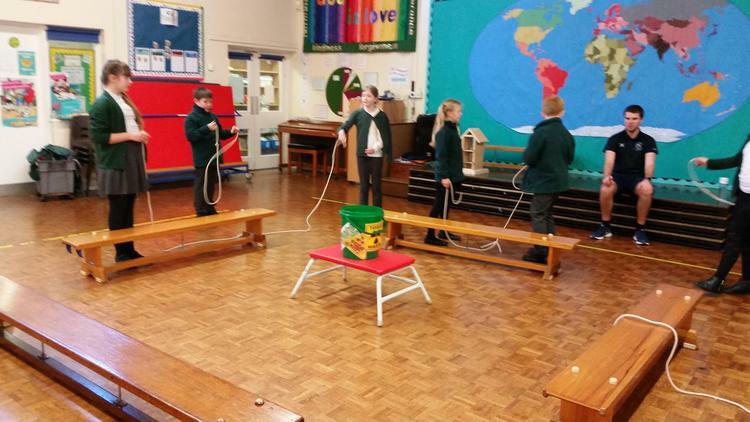 Friday's session saw working as a team and using ropes to move nuclear waste without touching it! At the end of the session, Mr Jones presented Jacob with an award for being his 'Pupil of the Term'. It was a great surprise for Jacob, but very well deserved as he has been an excellent team member who always listens carefully and makes sensible suggestions. 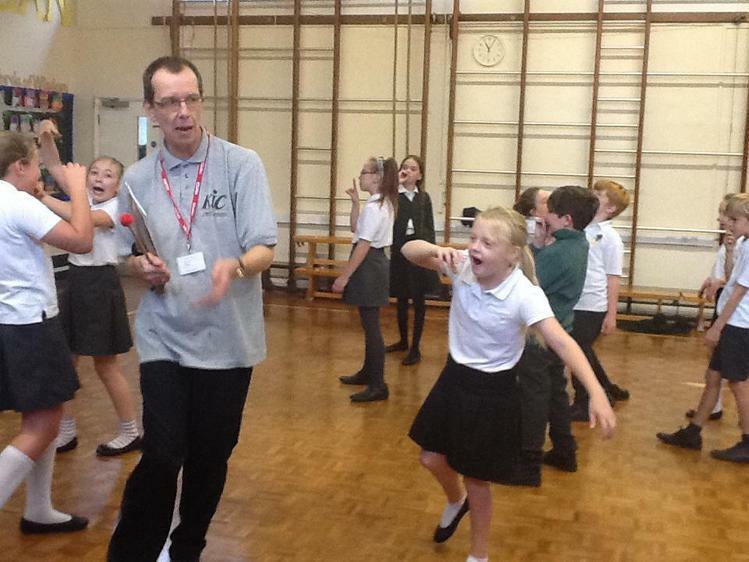 We were sad to see Mr Jones go, but we hope he may be back with us in the summer term. Another busy week has just flown by. It has been so cold this week that the temperature did not rise above freezing on Thursday, and early on Friday morning we had freezing rain which caused many accidents and left our playground as slippery as an ice-rink. That meant indoor play all day - not much fun at all (although we suspect some people were very happy to stay inside in the warm). We have been very busy this week writing short stories for the BBC Radio 2 '500 Words' competition. We are busy typing and editing them ready to send them off next week. Hopefully some of us will be lucky enough to see our stories getting through to the next round. As a break from Mrs Godden teaching us French this week we had Miss Manning, a secondary school teacher, teaching us vocabulary for clothes. We really enjoyed her activities including playing 'Splat!' and unscrambling words to find a hidden word. Did you know that the French say 'un pantalon' - a trouser instead of a pair of trousers and trainers are called 'des baskets' after basketball? Homework for Friday 27th January - due back by Friday 3rd February. Have you ever heard of Georges de Mestral? Nor had we until we learnt about him in our comprehension text this week. He was the inventor of Velcro and the idea came to him when he noticed burrs getting caught in his dog's fur and wondered how they managed to stick so well. (They are covered in lots of tiny hooks, if you were wondering.) Mrs Godden gave us a busy beach scene picture in French and asked us to work with a partner to write lots of descriptive sentences about it. She was really pleased with how well we did. Have a look at the picture below and see how much of it you could describe in French! 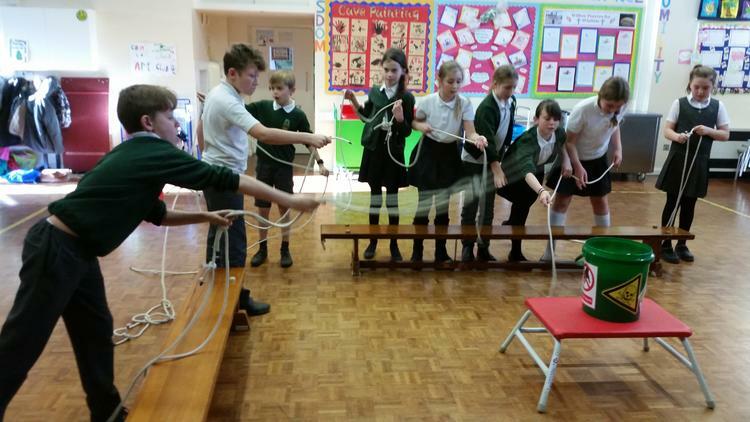 Our literacy focus this week was on a Balloon Debate. We worked in small groups to persuade the rest of the class why our character should not be thrown out of the balloon. Who would choose to throw overboard if your choices were a doctor, a fireman, a teacher, a premiership footballer, a gardener and a dentist? We created fascinating backgrounds for each character wrote some very imaginative and persuasive arguments for each of them to stay in the balloon. Our arguments will be presented to Beech Class and we will ask them to vote. It will be very interesting to see who is the unlucky balloon passenger! We began a new unit in English this week, focusing on balanced arguments. 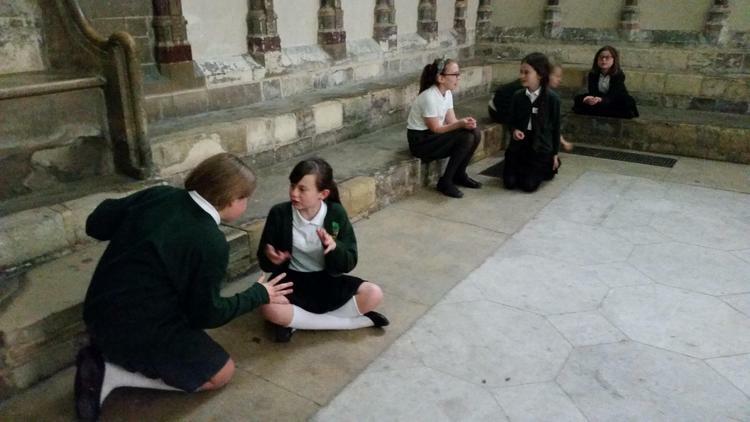 A number of themes for a written debate were discussed, such as 'Should School Uniform Be Banned?' and 'Is Homework A Good Idea?' Then followed a discussion on Vivisection followed by us writing our own arguments for and against this very contentious issue. 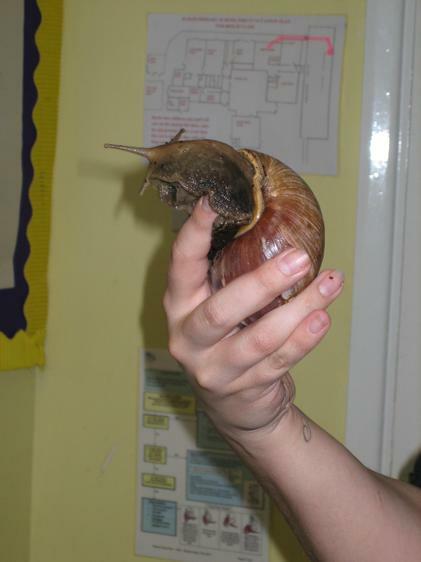 In science we continued our 'Inheritance and Adaption' unit by investigating how different animals have adapted over time to survive in their given habitat. 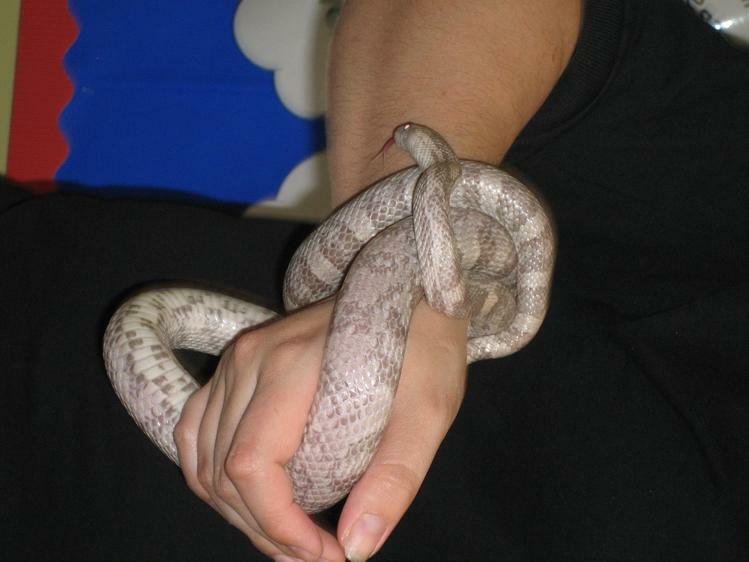 Species which do not adapt do not thrive and eventually die out. We were introduced to a new topic in history - the Tudors - and are looking forward to learning all about this fascinating dynasty which began with Henry VII in 1485 and ended with the death of Elizabeth I in 1603. Our French is really improving and we are now able to write interesting sentences to describe a beach scene such as 'La petite file porte un maillot de bain jaune.' and 'Il y a un grand bateau rouge sur la mer bleue.' 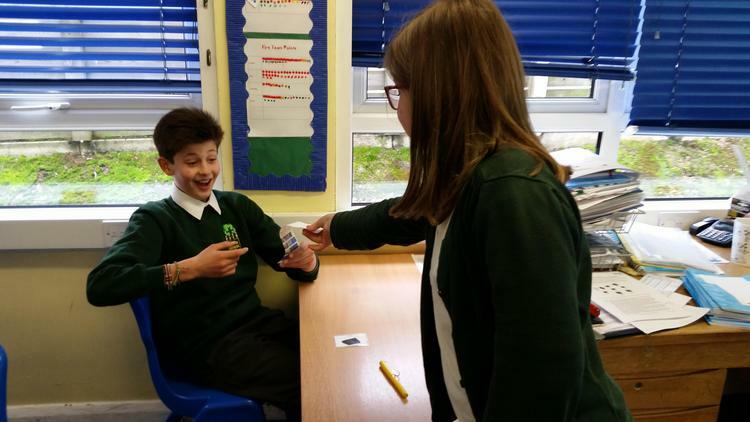 We have also been learning about the properties of circles, as well as how to use a pair of compasses to draw them accurately - this proved very challenging for some of us! We now know that the diameter of a circle is twice the radius and the circumference is the diameter x π (pi). Pi is a very special number which has no end. Have a look at the web link below for more information. 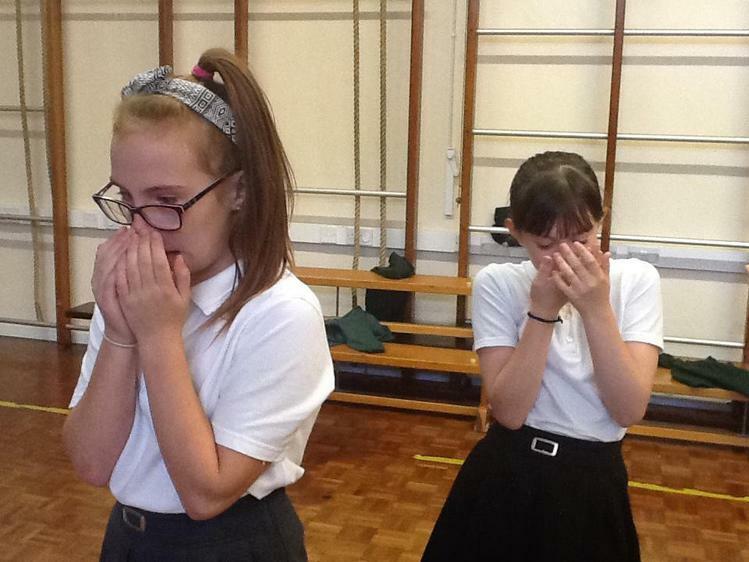 Friday was a very challenging day for both the pupils and teachers! It had snowed the night before, but melted and re-froze overnight. Our playground was like an ice-rink and too dangerous to walk on. We had to watch more snow falling during the morning, knowing we were not allowed out! 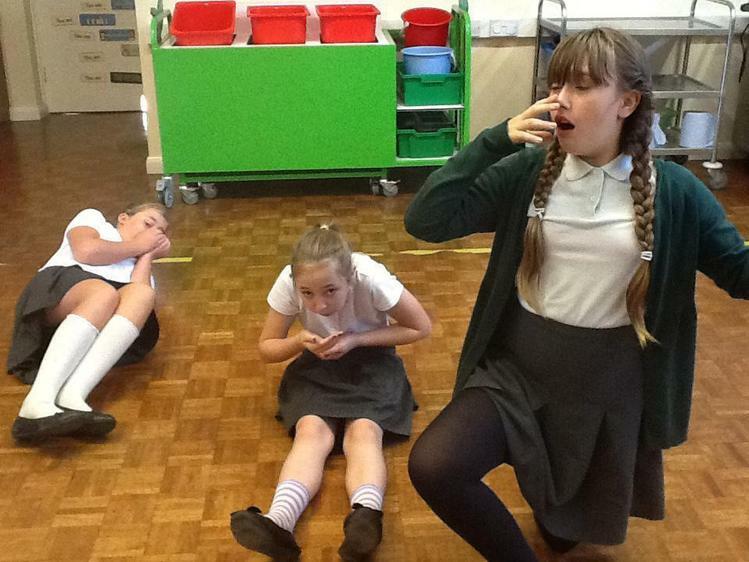 Needless to say, our concentration was not the best that day! Homework - no homework this week, but remember to learn your spellings, practise your tables and read for at least 20 minutes per day please. After a wonderful Christmas break, we all came back to school full of chocolate and stories about all the fantastic presents we received. We really are a very lucky group of children. Mrs Short asked us to write a recount of the festive season for our cold task in literacy this week. 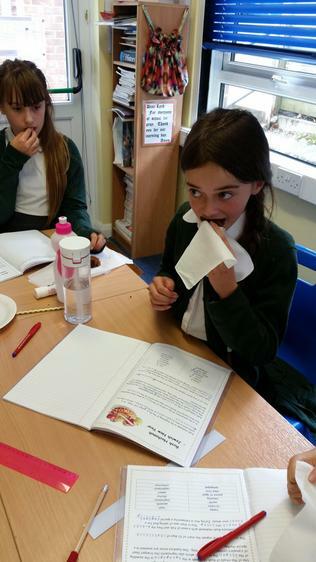 Much fun was had in science when our investigation of inherited traits had us all trying to curl our tongues! Did you know that the ability to do this is inherited from one of your parents? We are making great progress in French by writing simple sentences and improving them by adding adjectives and using interesting verbs. Before this week, all we really knew about circles was that they are round, but now we can tell you what is meant by a radius, diameter and circumference. Did you know that the diameter is twice the radius and the circumference is the diameter multiplied by pi (π)? Pi is a special number - it begins with 3.141, but it is infinite (never-ending). Why not challenge yourself to remember Pi to as many digits as possible? We also learnt how to draw circles to precise measurements using a pair of compasses. Some of this found this rather difficult and needed lots of practice! Homework - please complete the sheet on the traits you have inherited from your parents and return this to Mrs Short by the end of next week. Don't forget spellings, tables and reading as usual. Christmas has certainly been the theme in school this week. We have used 'The Twelve Days of Christmas' for maths problem-solving and drawn Christmas pictures using coordinates. In French we had to translate instructions in order to decorate a Christmas tree - some of us found this more challenging than others! The well-know poem 'Twas The Night Before Christmas' was used for our short comprehension lesson and we also used Purple Mash on the laptops to make Christmas cards for our friends and families. Don't forget that you can log on to Purple Mash at home at any time and use any of the fantastic resources on their, from creating a database or writing an information leaflet, right through to coding a computer game. The link to the home page is given below - you just need to remember your login and password details, which most of you know off by heart now. If in doubt, look on your Computing folder. Great fun was had by the whole school on Thursday when Mr File and all the TAs took all the children into the hall to make Christingles for Friday's church service. it was lovely to see the Year 6s helping the Reception children to decorate their oranges. Our last day of Term 2 finished with a beautiful Christingle service in St Mary's church where each and every child had the chance to light their Christingle and Rev. Jane explained the significance of each element of it for us. Luckily there were no accidents with the naked flames! We very much enjoyed ending our year singing some of our favourite Christmas songs. Mrs Short, Mrs Godden and Mrs Vincent would like to thank all the parents and children who so kindly gave us Christmas gifts. We really appreciate you thinking of us at this time and will certainly enjoy all the wine and chocolate, plus our other lovely presents. Merry Christmas and a Happy New Year to everyone! We hope you have a wonderful break and look forward to seeing everyone back in school on Tuesday 3rd January 2017. There is no homework over the Christmas holidays. However, please keep up with your reading and tables practice. There are no new spellings to be learnt, but the first test of Term 3 (on Friday 6th January) will be a random selection of words from all those previously learnt and tested in Terms 1 and 2, so please spend a few minutes each day re-learning these words. It is beginning to feel very Christmassy in school. Christmas trees have appeared in the hall and in our classroom too, and we often catch the KS1 children busily rehearsing their nativity play. With Mrs Short we made and decorated boxes to go on the Christmas tree as our advent calendar. Each box contains some chocolate coins and a message to the lucky recipient - one person is selected to open a box each day. Mrs Godden taught us how to make woven paper heart baskets and these are now hanging up in class as decorations. (See the link below for how to make these if you want to make more.) We have been promised some chocolate to go in them when we take them home to hang on our own trees. In RE we learnt about the importance of The New Testament to Christians and we are getting very good at finding Bible references. 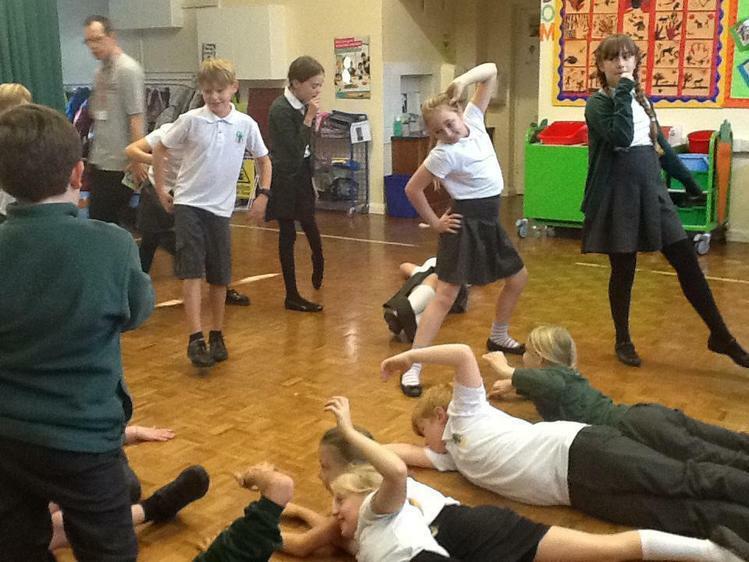 The week ended on Friday afternoon with everyone watching the dress rehearsal of 'It's a Cracker!' If you are planning to see the nativity play next week, you are in for a real treat. 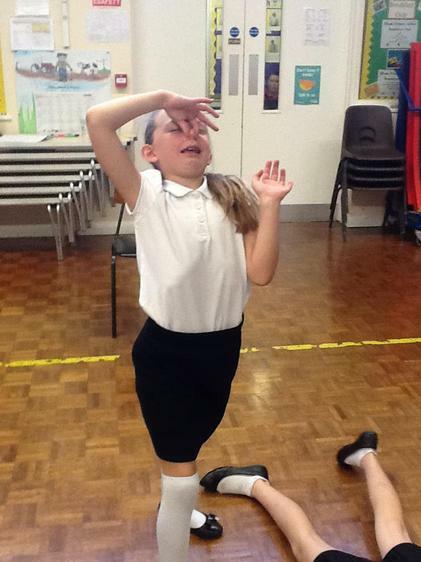 KS1 were fantastic - especially Willow Class who had to swap some main roles around at the last minute due to sickness. Another week has just flown past. 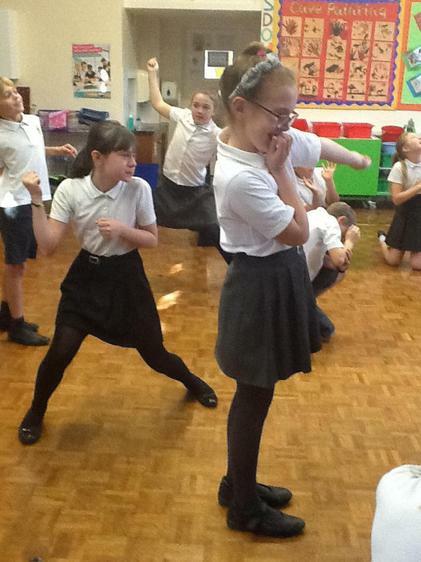 We continued our work on Degas in French, this time focusing on the action taking place in the picture (French verbs). This dovetailed very nicely with our GPS on Friday where we investigated verb tenses. You will no doubt know about the past, present and future tenses, but can you explain the past simple, the present progressive? * We will be working on recognising these in our next GPS lesson. Thursday afternoon saw us joining the rest of the school for a concert led by Karen Hickman where we all had the chance to share what we have learnt so far this year, be it on the ocarina or fyfe, or by using our voices to sing. On Friday we learnt about the history of the Old Testament and began creating our own posters about it using Publisher on the laptops. The school is beginning to look very festive in the run-up to Christmas and our Christmas fair on Friday was very much enjoyed by all the children. The traditional French crepes were a real hit, as was Santa's visit. Rest assured that there will be plenty of fun, Christmas-themed lessons to come over the next two weeks. We got creative with our writing this week when Mrs Short asked us to write a character description of Ebeneezer Scrooge from Charles Dickens' 'A Christmas Carol'. She was very pleased with the results. In maths, we have been practising our compact multiplication and division methods, especially using larger numbers. We then moved on to using these skills to solve mathematical word problems. On Friday morning we were joined by a teacher and a group of Year 13 students from The Harvey Grammar School. 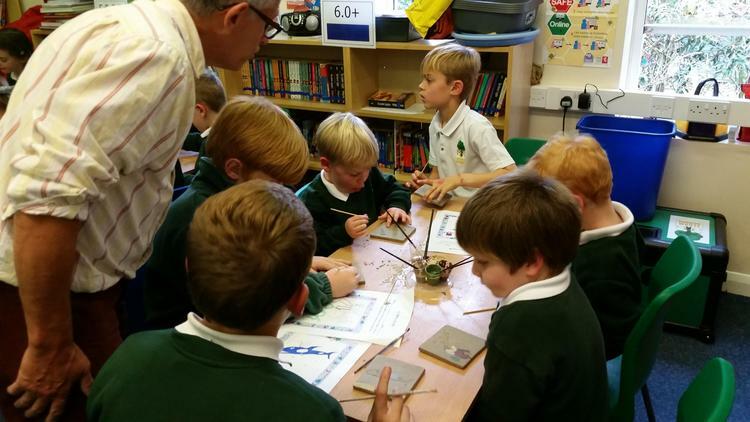 They very kindly set up workstations around the hall where we could investigate the different parts of flowering plants such as the roots, reproductive organs, cells and seeds. It was fascinating to look at cells under the microscope and carry out our own experiment on how water and nutrients travel up the stem to the rest of the plant, but the most popular activity was definitely the pop-corn machine! Homework - please learn spellings and practise your times tables as normal. Aim to read for 30 minutes per day. Complete the worksheet below on Bible references. If you do not have a Bible at home and do not have access to the internet, please ask in class and we will lend you a Bible. We almost had a 'normal' week this week with English and Maths every day. 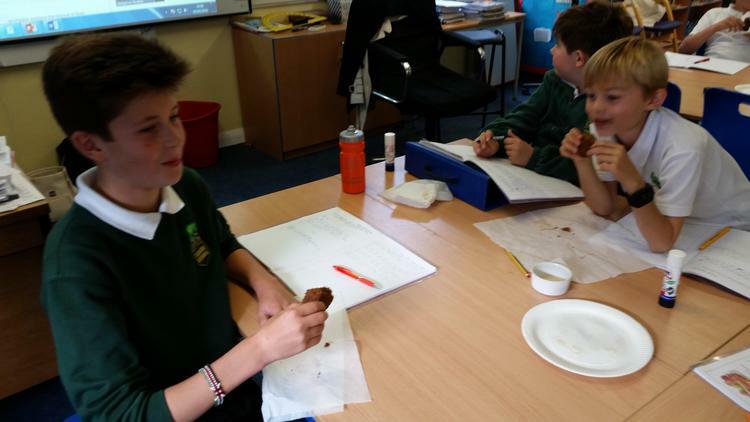 In RE we studied the Jewish festival of Pesach (Passover) and the significance of the Seder plate and the special foods found on it. If you are interested in what we learnt, have a look at the link below. 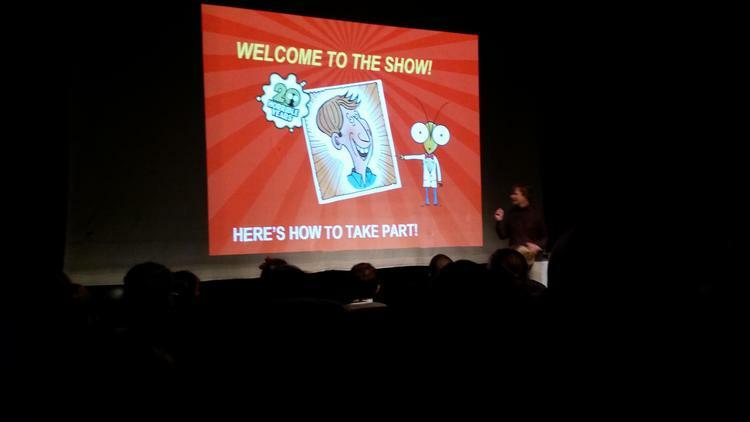 On Friday, we went on a special schools' trip to The Quarterhouse in Folkestone to watch the Horrible Science show. 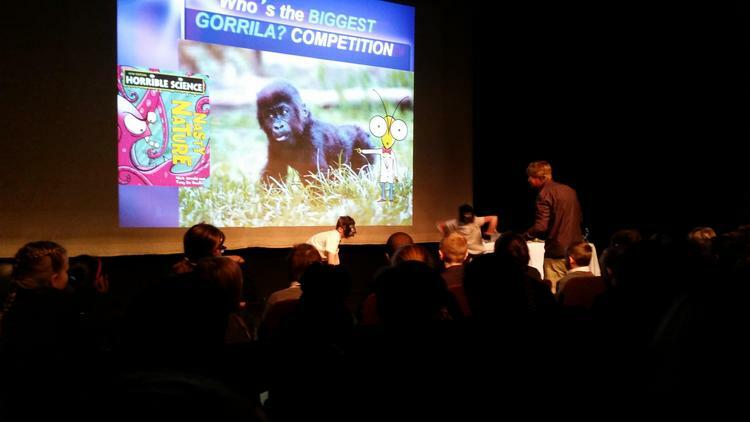 This was a free event put on by the Folkestone Book Festival for Year 6 children. 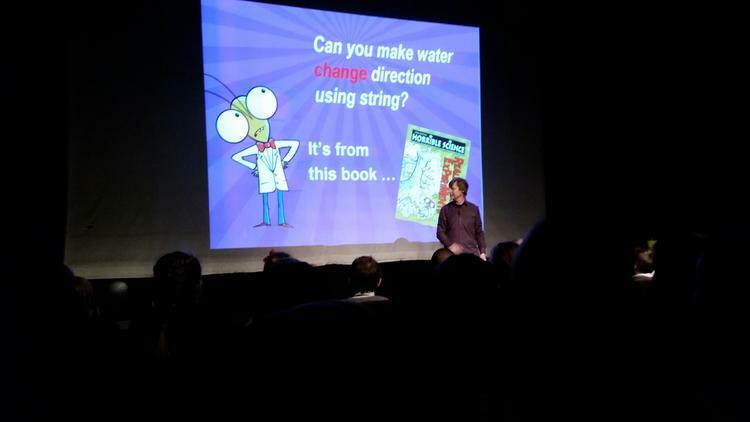 It was great fun watching other children take part in some gruesome but entertaining experiments with the author of all the Horrible Science books, Nick Arnold. Lily O'Connor made a fantastic gorilla! As today was Children in Need Day, many of us bought our teddies to school along with a contribution to the fund-raising. Thank you to everyone who participated. Homework - learn your spellings, practise your times tables and read for at least 30 minutes per day. No other homework this week. The Seder Plate at Passover This website explains the items on the plate and their significance to Jews. 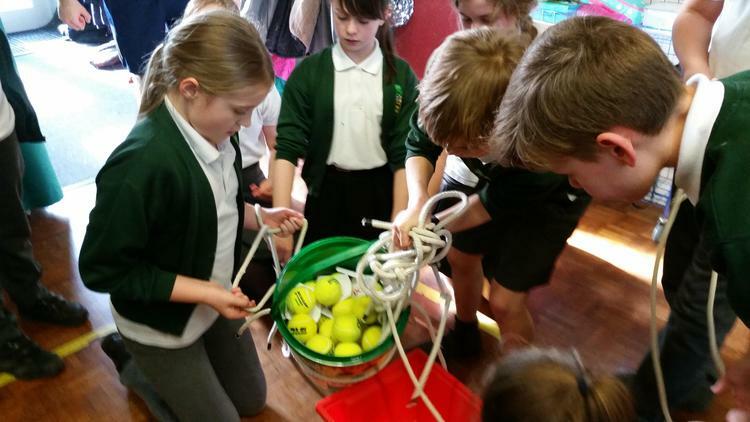 This week was another busy one for the children of Oak Class. 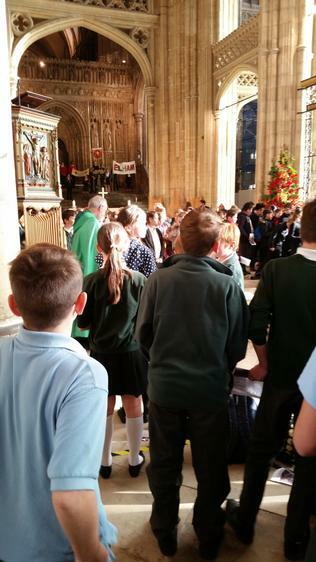 As well as our normal lessons, we had a very special day on Thursday when we joined over a hundred other children from the diocese for the Schools' Cathedral Day. 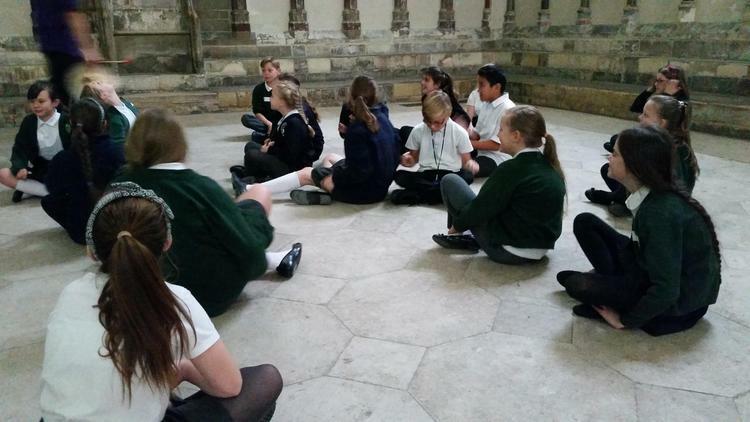 It was wonderful to spend a day in our mother church taking part in workshops on the five senses, doing drama in the chapter house and designing our own stained glass windows. 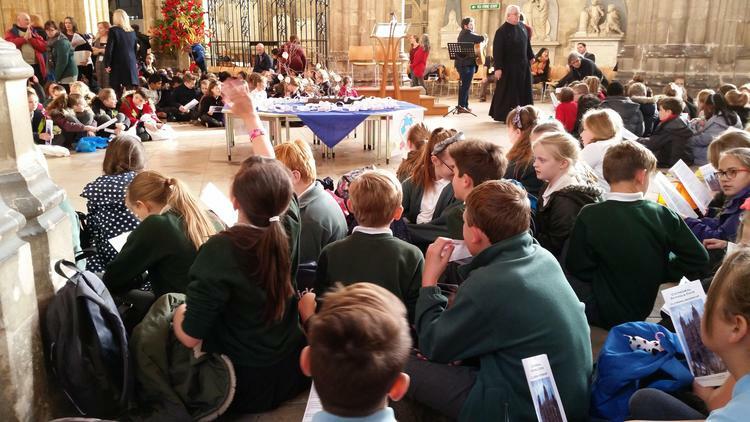 The day culminated in a service in the nave with all the children sat round listening to readings and joining in with some fun songs. It was a day that we will all remember for a long time to come. Thanks go to all the parents who helped take us to and from Canterbury. 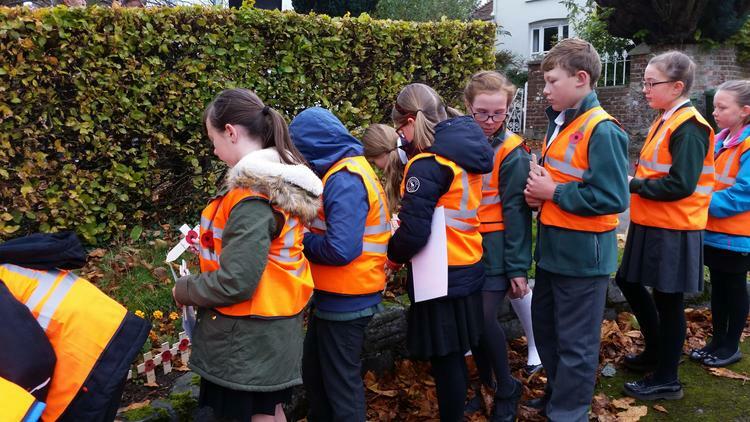 Friday 11th November is, as you know, Armistice Day and this was Year 6's opportunity to show their respect for all those from the village who have given their lives for our freedom. Rev. 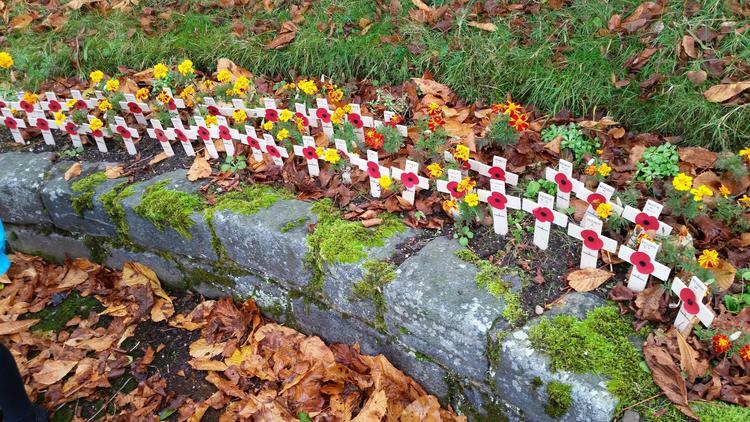 Jane led us to the war memorial for 11am where we held a short service and planted crosses for each of the fallen soldiers. 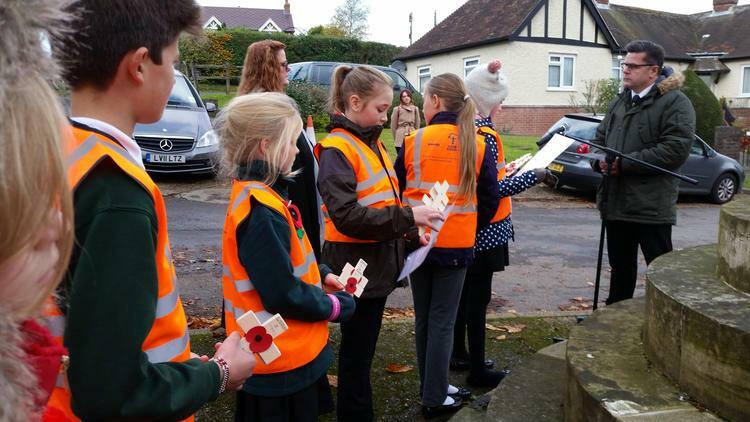 Some of us also read out poems and prayers written especially for Remembrance Day with Mrs Short earlier in the week. 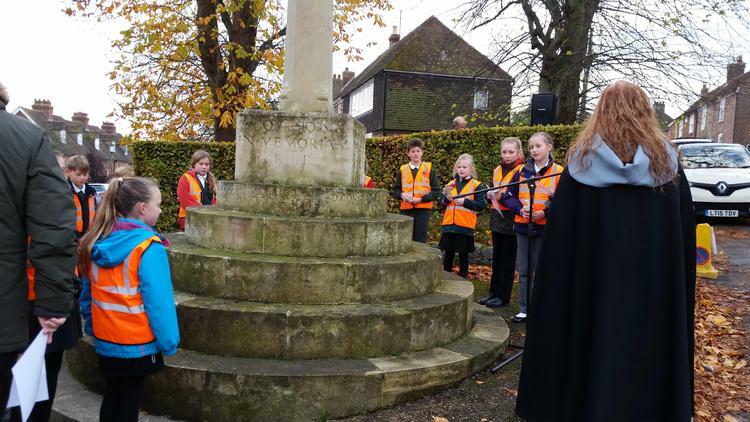 Later the same day we were privileged to listen to Henry Shakleton, Elham's own war hero, regale us with his tales of flying a Lancaster bomber during WWII and being shot down over Berlin where he spent the remainder of the was as a POW (prisoner of war). Whilst being very entertaining, his adventures reminded us all of how lucky we are to live in a time of peace in our country and to hope that we never have to face what he once did. 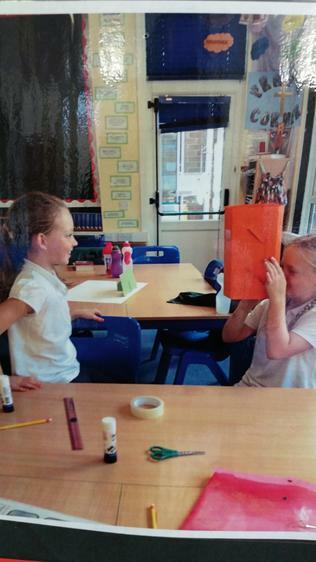 After a sunny half-term week, we all returned to school happy to see our friends and ready to learn. 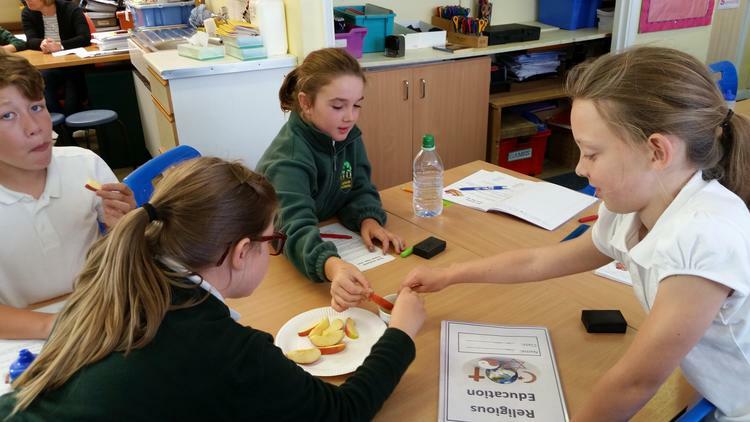 Maths was a little tricky for some of us this week as we tackled ratio and proportion. Mrs Short was very patience with us and we finally mastered this. 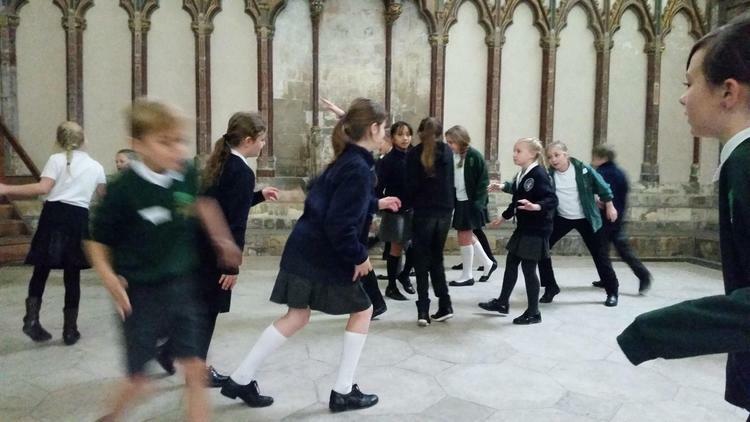 We had the chance to use our imaginations in this week's creative writing task. Following our topic work on the eruption of Vesuvius in AD79, we each wrote a witness account of the explosion and the subsequent chaos. 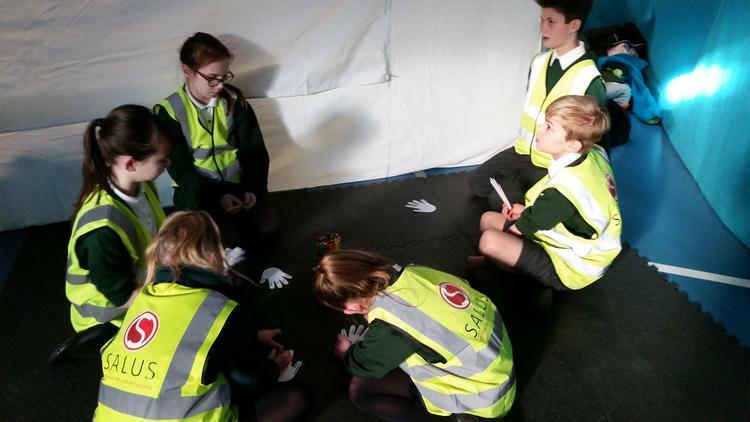 It was quite scary putting ourselves in the shoes of an Ancient Roman who was actually there at the time, but it gave us an opportunity to demonstrate our best writing. This week ended with some fun activities. 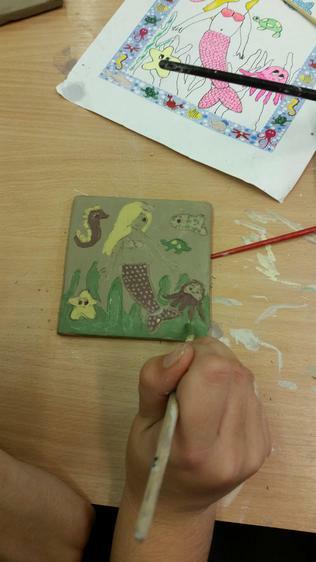 On Thursday we go the chance to paint clay tiles with a sea-themed design. 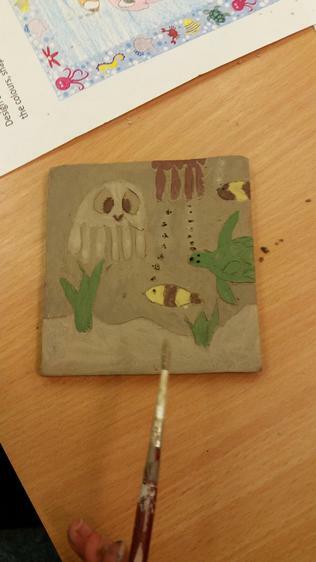 We had drawn our designs in class, then we had to transfer them to clay. It wasn't easy as the special paints we used are not the same colour as they will be once the tiles have been fired in the kiln. 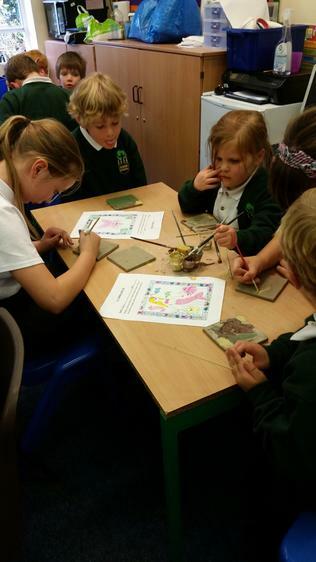 We also had Acorns working side by side with us so that we could help them with their designs. 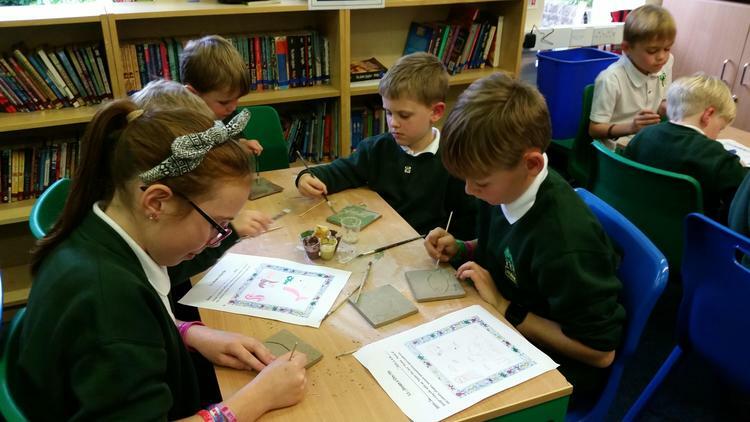 We really enjoyed this craft work and can't wait to see our finished tiles once they have been fired in a couple of weeks' time. 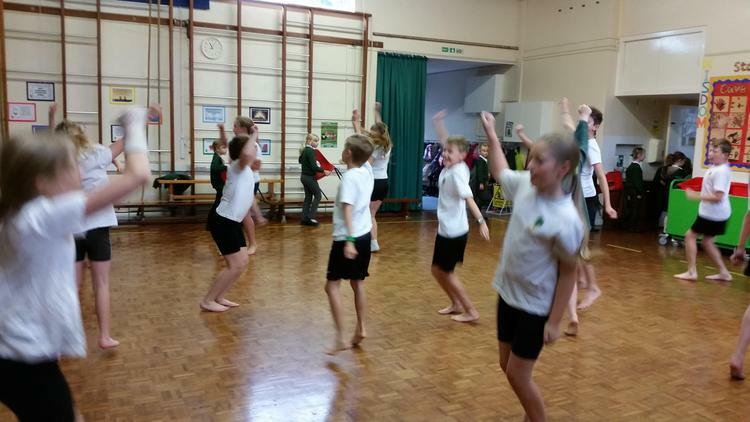 Friday saw us burning up lots of energy in our Dance for Fitness workshop. 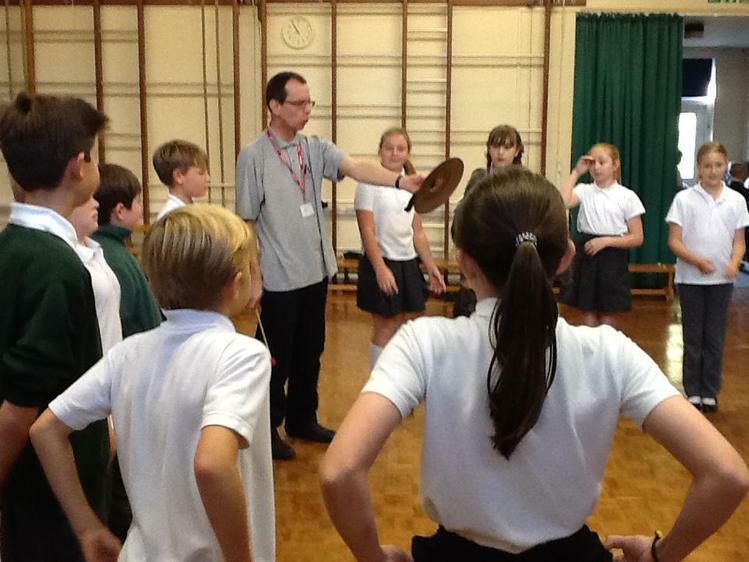 We always love this and everyone joined in really well. 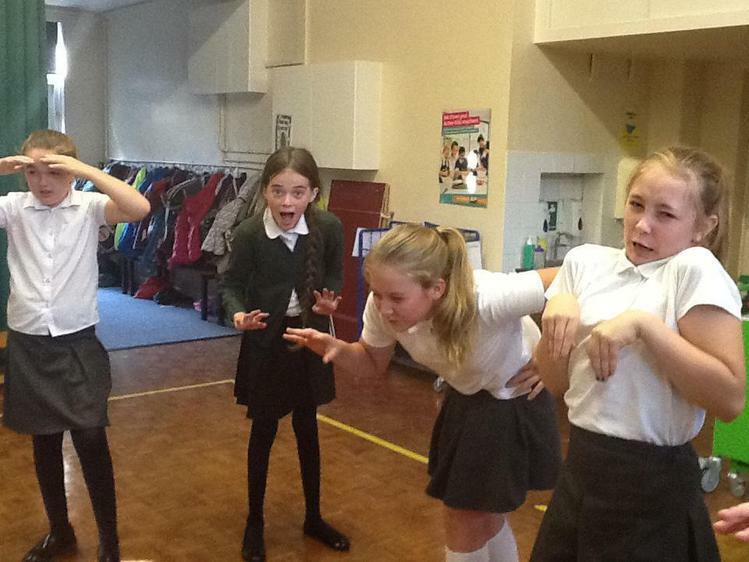 Ask us to demonstrate 'The Chihuahua'! Mrs Godden said it was the quietest Friday afternoon for some time, so it must have worn us out! Bon weekend tout le monde. Homework - Write an acrostic poem about Hanukkah (use the second sheet for ideas). Due in by Friday 11th November. This week many of us received our Kent Test results - it very scary and nerve-racking waiting to find out if we had passed or not and there was great relief in class once we all knew what our secondary school choices would be. Now we can move on and enjoy all the great things we will learn about this year. Top was really interesting again this week. We watching a film of the eruption of Mount Vesuvius in AD79 and you could see everything and everyone being buried with the ash. It must have been horrifying for the poor Romans living there at the time, but it is thanks to town being buried that we know so much about it today. Mrs Short asked us to write character descriptions this week. We each picked from an interesting list of fictitious names on the board and we had to describe the character from the name. These are some of the names we had to choose from: Lady Phillipa Montague, Sam Smart, Sarah Sharp, Edgar Moanalot, Lucinda Blossom, Charlie Wheeler, Kev Tough, Tracey Jones, Marvin Trunch - they were all chosen by Mrs Short! We have enjoyed/suffered a week of fractions, depending on how we feel about them! We have covered many aspects of fractions - how to multiple and divide, common denominators, equivalents and fractions of amounts. We ended the week calculating angles around a point and finding missing angles. 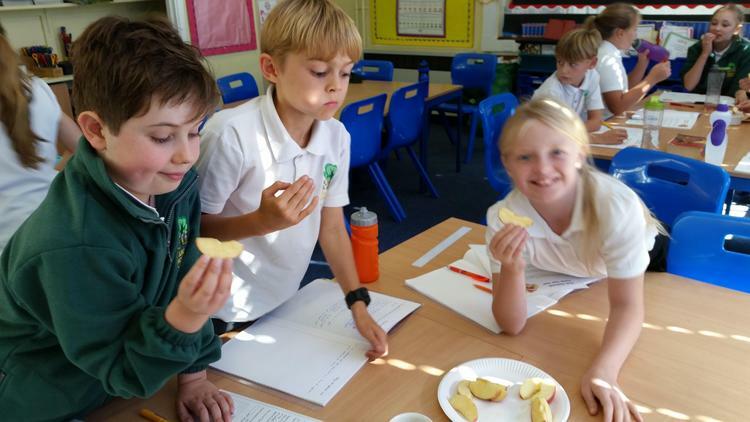 We finished our 'Falling Apples' games in computing and improved them by dding rotten apples with minus scores, golden apples with higher scores and messages at the end of the game. If we had had enough time, some of us would have added more levels to our games, making each progressively harder. In French we can now sing the French alphabet to the tune of Twinkle Twinkle Little Star! Did you know that the French call W 'double V' which makes sense as it does look more like a double V than a double U? 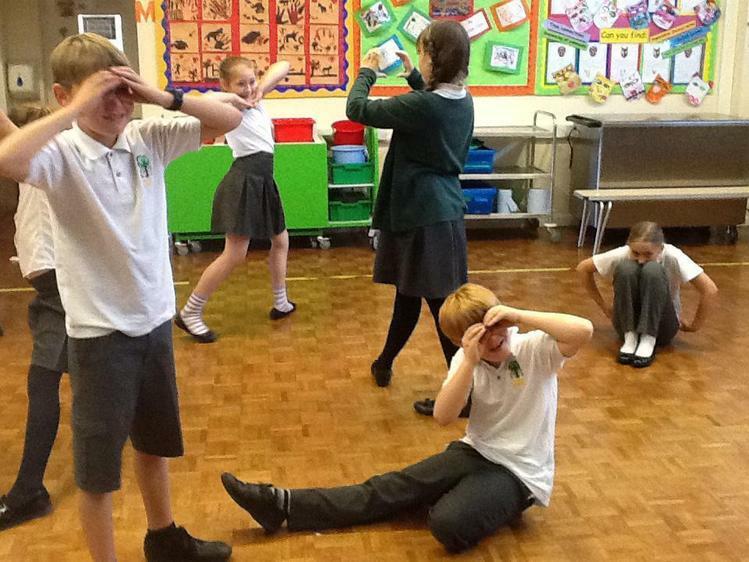 On Friday we were lucky enough to have Kic Theatre working with us. 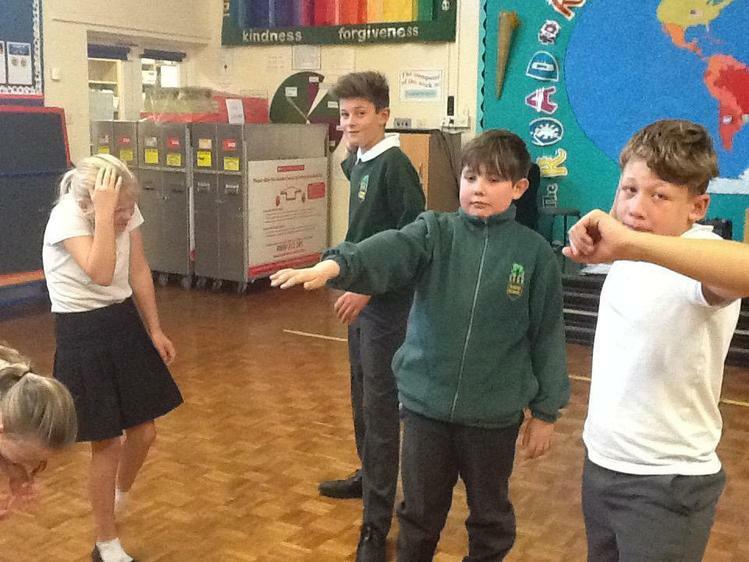 We worked on our drama technique, using characters from Roald Dahl stories as the focus. It was really funny and you can see some photos of us in action below. Whew! Time for a lie-down now, we think! This week's maths homework. Due in by Friday 21st October please. 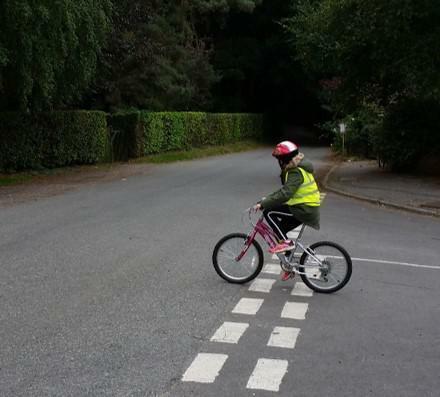 This week has been Bikeability Week for the children in Oak Class. 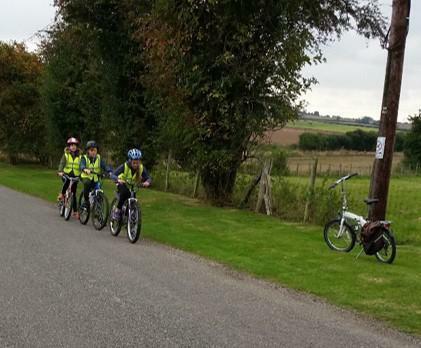 We all enjoyed the challenge of learning to control our bicycles safely on busy roads despite a few mishaps along the way! 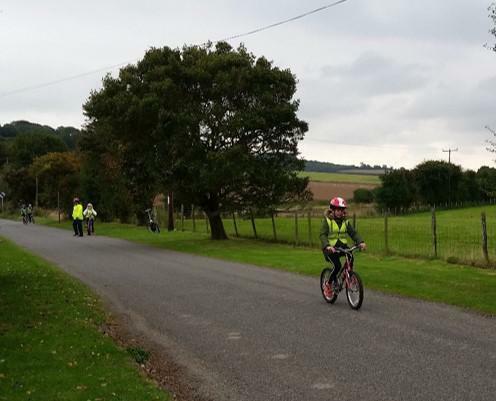 (Eve falling over her handlebars and Tim breaking his helmet before he even started.) 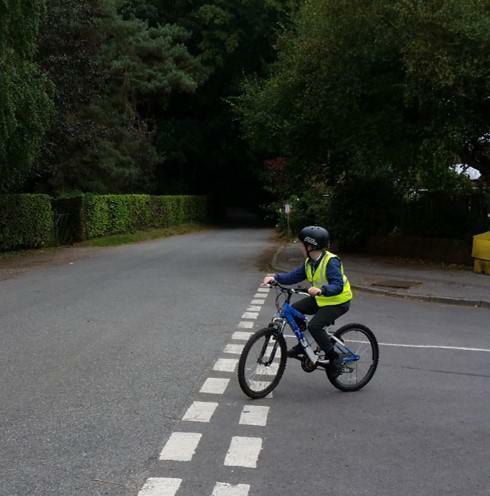 Joel and Crispin now feel confident to ride to school and we hope that those who don't live so close to school will make use of their new skill closer to home. 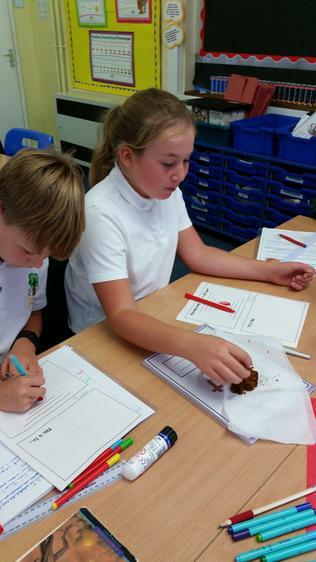 Science was great on Monday. 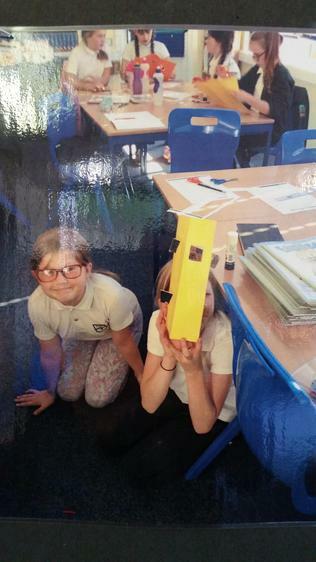 Our topic this term is 'Light' and Mrs Short showed us how to make and use periscopes. We learnt that periscopes only work because light travels in straight lines and is reflected by mirrors. There are some pictures of us experimenting below. 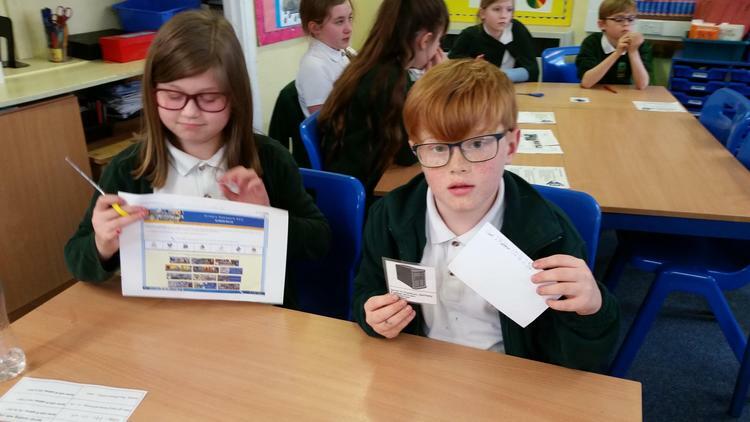 We were also excited to try out the new reading scheme - reading a book from the new library, taking a quiz on it and earning points for every question we get right. We can still bring in books from home to read in class if we wish, and we can scan them to see if they are part of the scheme. 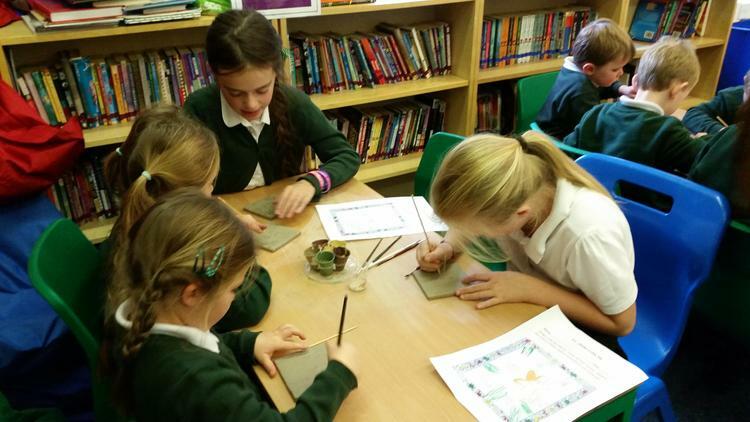 Life in Pompeii in AD79 was the theme of our topic lesson this week. It was fascinating to learn about the Romans who lived happily in the shadow of Mount Vesuvius, completely unaware of the destruction it was about to cause to the town and its people. Over the last two weeks, we have built a new game each in Scratch. It's called 'Falling Apples' - the player has to catch the apples in a cart as they fall from the tree. 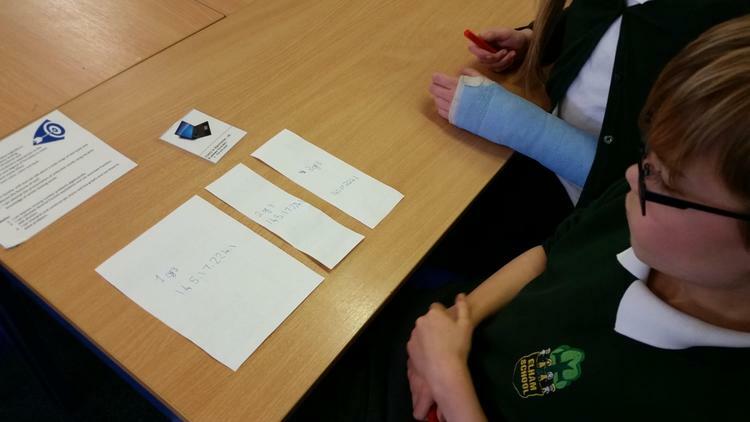 We learnt to use programming skills such as repetition, variables and if/then statements. Just ask us if you don't understand any of these concepts. Scratch can be used at home either online or by downloading the free software. Links for this can be found below. Did you know that Thursday was National Poetry Day? Well we didn't either until Mrs Godden told us! We looked at a poem about autumn in our comprehension lesson, then in French we wrote our own poems about parts of our bodies. It helped up learn about French verbs and how to use a bi-lingual dictionary correctly. The best copies of our poems were written as calligrams and should be on display on our class board in the hall soon. We had a special Harvest Festival assembly in St Mary's Church. 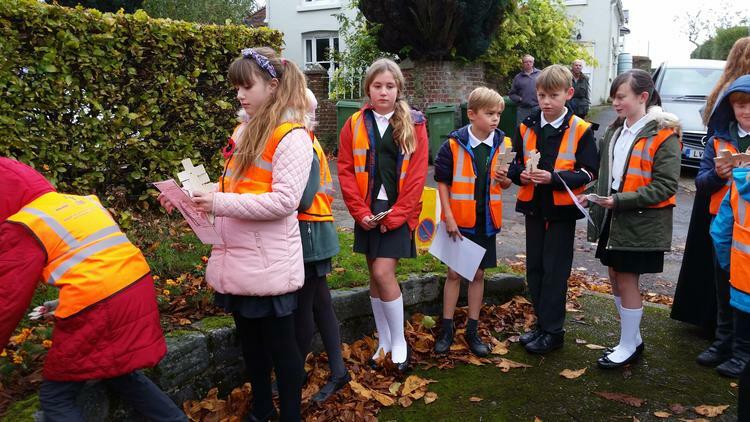 Some of us had fun helping the reception children walk to and from church. We each had something to say and stick onto a giant pizza to show everyone how far different foods travel to reach us (It's called 'Food Miles'). Did you know that tuna fish comes from Maurutius, 5600 miles away and mozzarella comes from Italy, 1000 miles away. Our pizza was huge! 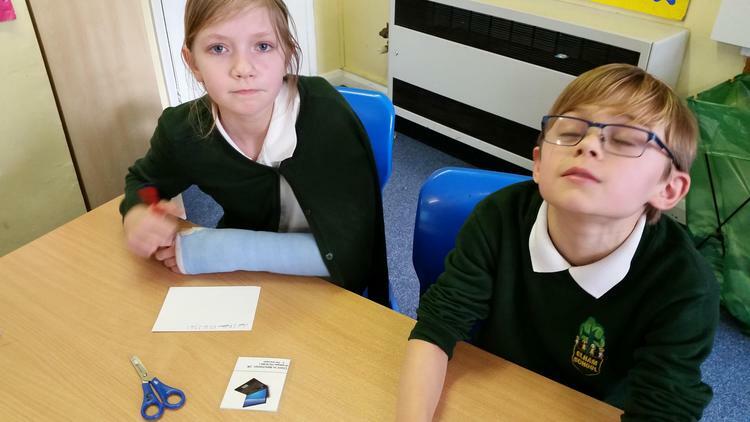 Although it is still September, we make Christmas cards this week so that they can be sent off and made into packs of our own designs for our parents to buy and use. It was challenging to get our background wash colours just right and design cards which would look good when printed smaller. We have also realised that Autumn is not always cold - it has continued to be warm and sunny most days this week. 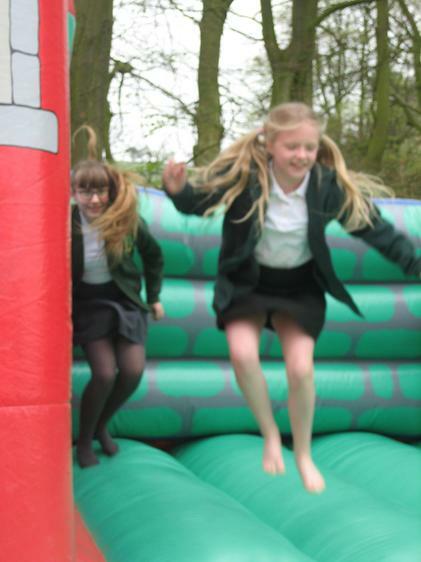 RE on Friday was really fun. We learned about the Jewish new year celebrations (Rosh Hoshanah) and how it is a time for reflection and asking God for a sweeter year to come. We dipped apples in honey and ate a special sweet and spicy cake to remind ourselves of wising for sweetness in the future. Please read as usual and learn your 9x table (plus any others you have not completed yet). This week's maths sheet is on identifying angles - if you have mislaid your copy, then please ask Mrs Vincent for another. This week's spellings are: balance, distance, science, sentence, difference, absence, performance, influence, audience, importance, reluctance, presence, appearance, nuisance, sequence. 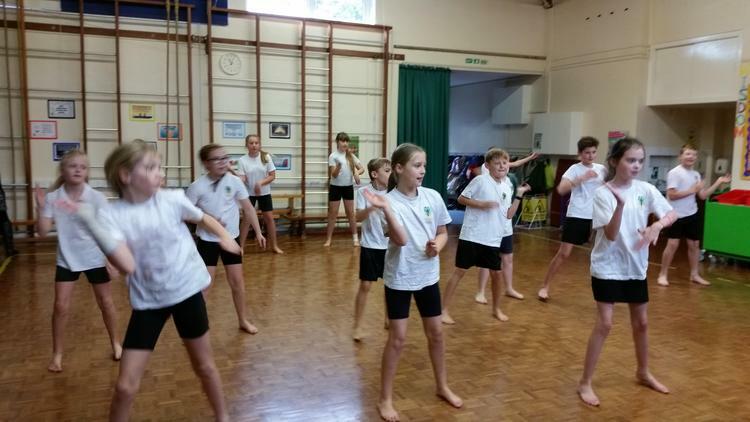 We are now all well-settled into our new routines in Oak Class and are working hard. 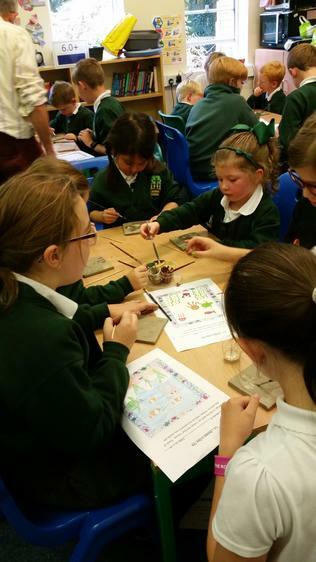 This week gave us the opportunity to work in collaboration with Beech Class. 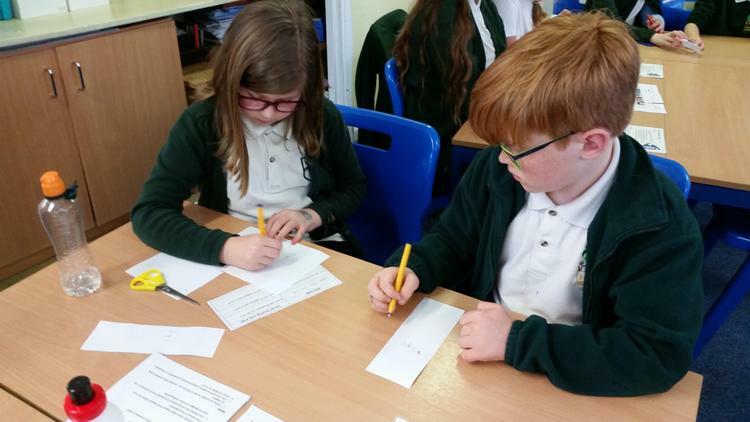 During one session we took part in a lively debate with Miss Burgess on whether or not we should wear school uniform, then we worked in mixed-year group teams to answer a variety of maths questions in the form of a quiz - some of them were very challenging, but we all enjoyed taking part. On Thursday we all took an online test to find discover our reading ability. Our scores will tell us which books we can choose from the new library, then once we finish a book, we can earn points by answering a selection of questions about it using either the iPads or the laptops. We are all excited about reading our first books and trying the quizzes. Next week our Harvest Festival service takes place in St Mary's on Tuesday afternoon and we had fun on Friday creating huge tomatoes, pineapples and peppers for our presentation. You'll have to join us in church to see what we make from them! Reading - try to read for at least 20 minutes per day. Write about your reading each week in your Reading Record. These need to be brought in every Monday for Mrs Short to check them. Spellings - spend a few minutes each day learning your spellings. These will be tested on Friday mornings and new spellings given out. You need to bring your Home Spelling Book in every Friday. Times Tables - next week's test will be the 7 and 8 times tables. If you did not score full marks on the 3,4 or 6 tables, these will be retested next week. Please practise your tables daily. You will be tested on Thursday. Maths - please complete the sheets on adding fractions. You will have been given a double-sided sheet to complete - please check with me or Mrs Vincent if your are unsure which sheets to complete. This homework is due back by Friday 30th September. 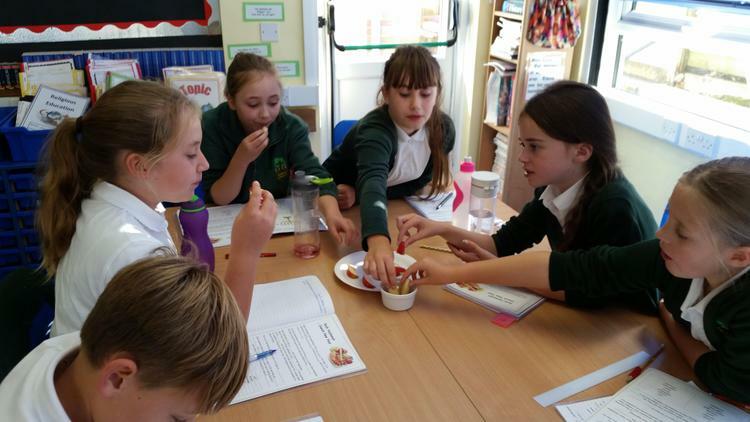 This week some of us have started our new roles as buddies and fruit tuck-shop monitors, which we are really enjoying (Chloe in particular). Mina has enjoyed learning about the Menorah in Judaism - we've put some information about it below. 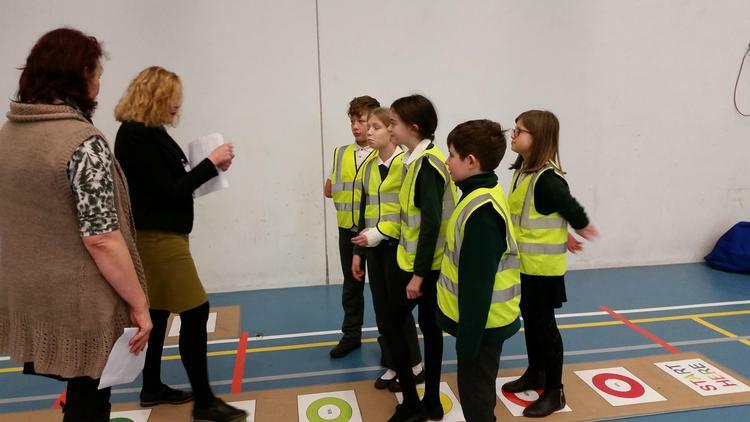 Poppy, Hannah P, Jacob and Herbie have taken on the role of assembly monitors and are doing an excellent job in setting up the music each day. Evie's favourite lessons this week have been French (La Carnaval des Animaux by Saint-Saens) and Computing (learning to program the perimeter of shapes in Scratch). We have done a lot of tests this week, so that Mrs Short and Mrs Godden can find out what we already know and what we still need to learn. 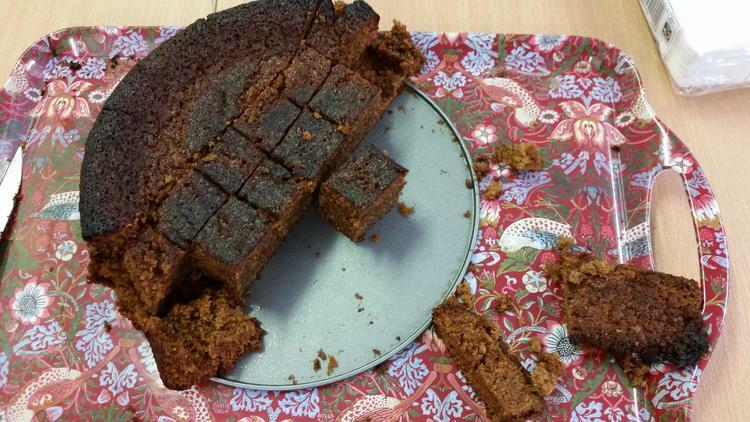 They have been hard work, but some of us even enjoyed them (Lilly, Eve and Crispin to name a few)! We began our topic work on Pompeii. Did you know that Vesuveus erupted on 24th August AD79? After a lovely hot and sunny summer, the weather finally broke on Friday and we had our first wet play of the year. We are all hoping for the sun to reappear over the weekend! Reading - try to read for at least 20 minutes per day. Write about your reading each week in your Reading Record. These need to be brought in every Wednesday for Mrs Short to check them. 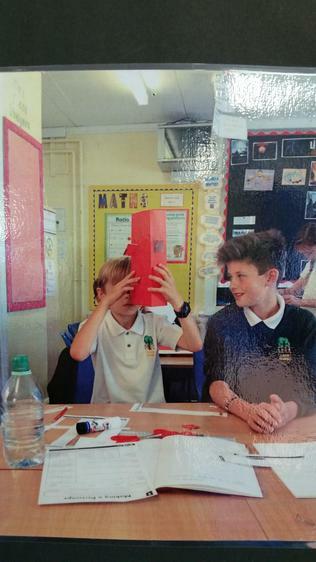 Times Tables - next week's test will be the 3, 4 and 6 times tables. Please practise these daily. You will be tested on Thursday. Maths - please complete the sheet on naming quadrilaterals, making sure you spell the shape names correctly. This homework is due back by Friday 23rd September. The Menorah Visit this website to find out all about the Menorah and how important it is to Jewish people. Maths Homework Sheets (quadrilaterals) - please complete both. 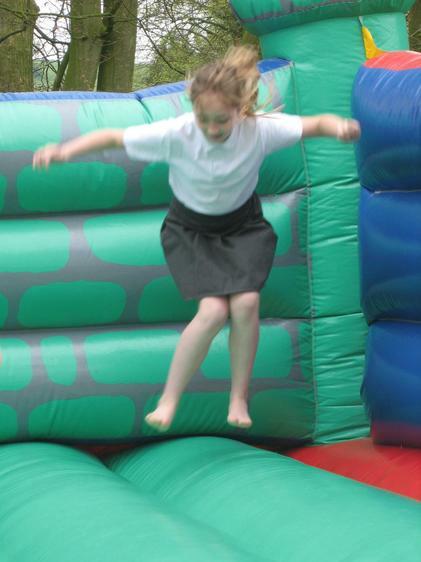 So, our first week as year 6s has just flown past. On Thursday we had to deal with the dreaded Kent test! It wasn't particularly exciting (Oscar's words), and I learned that I don't like spacial reasoning (Eve's words). Now we all have to wait a few weeks for the results, so fingers (and toes) crossed! Mr File is the best for letting us have ice-lolliess as a reward for taking the test. A big 'Thank you' Mr File for doing this for us. 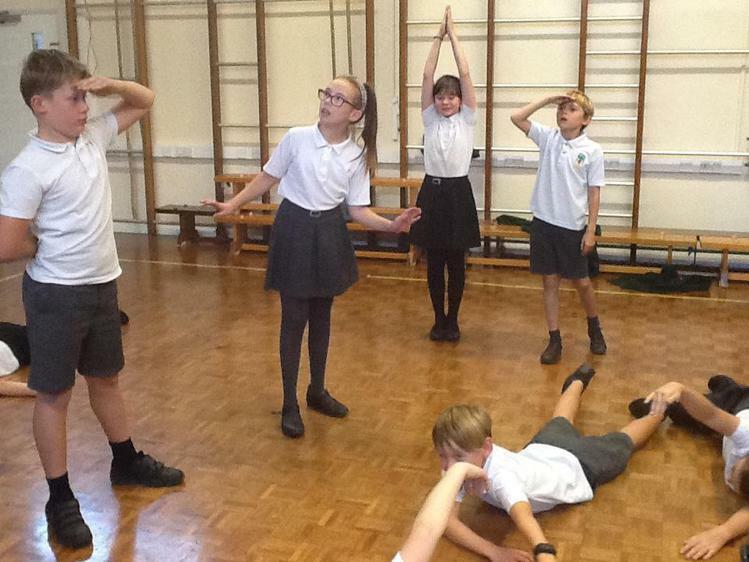 We have decided that the best thing about being in Oak Class is the air-conditioning - Beech class was very hot and stuffy, a bit like a sauna in fact. Miss Burgess is the loveliest teacher ever (Mina's words), but it's also nice to have new teachers for year 6. 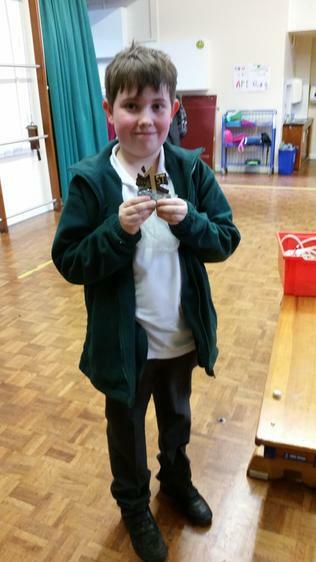 Our favourite subjects this week have been PE and maths (and lunchtime (Oscar's words)). This week's homework from Mrs Godden is to learn your spellings really well and to complete the mini poster on Judaism to go in the front of your RE book. (There is a copy below if you lose yours.) Draw as many pictures as you can of things to do with Judaism, label them or add some facts if you like and make it bright and colourful. 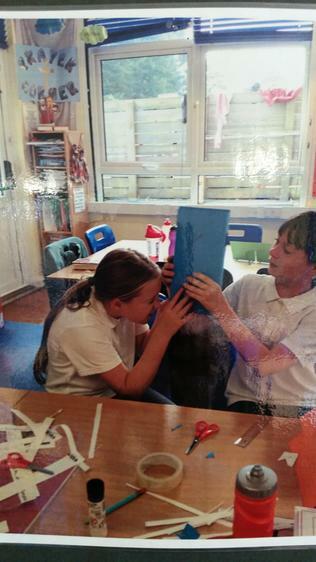 Posters due back by next Friday 16th September please.